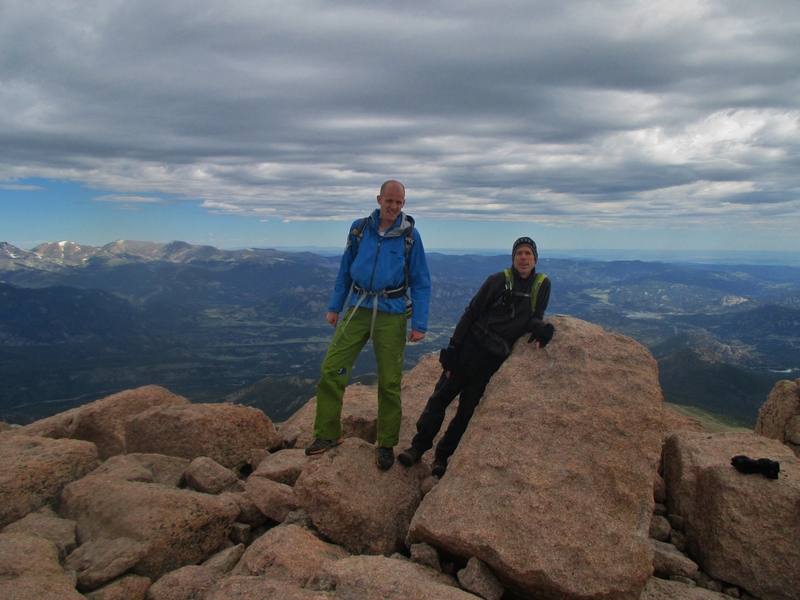 Allison’s dad and I made the summit of Longs Peak (14,259′) via the Keyhole Route on 7/24/15. Allison dropped us off at the TH. The vast majority of people who summit Longs in a single day utilize a 2:00-3:00 am start time…so the trailhead parking lot was already filled to overflowing when we arrived a little before 5:00 am. The forecast only showed a 10-20% chance of afternoon precipitation, so we decided to take a small gamble on the weather in exchange for an extra few hours of sleep. We also made pretty good time en route to the Boulderfield. Got passed by two or three fast-moving guys, but we overtook a dozen or so others. Looking up at Longs from the Chasm Lake turnoff. 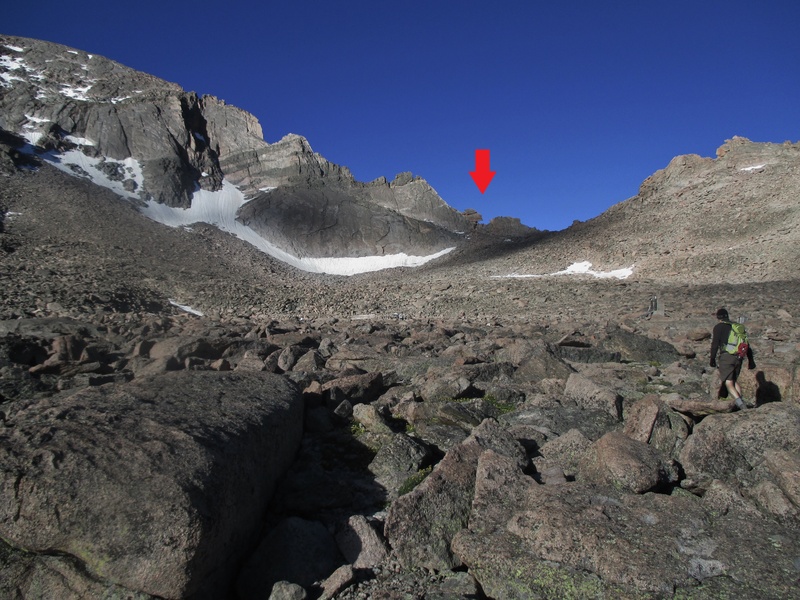 Heading across Boulderfield toward the Keyhole (arrow). 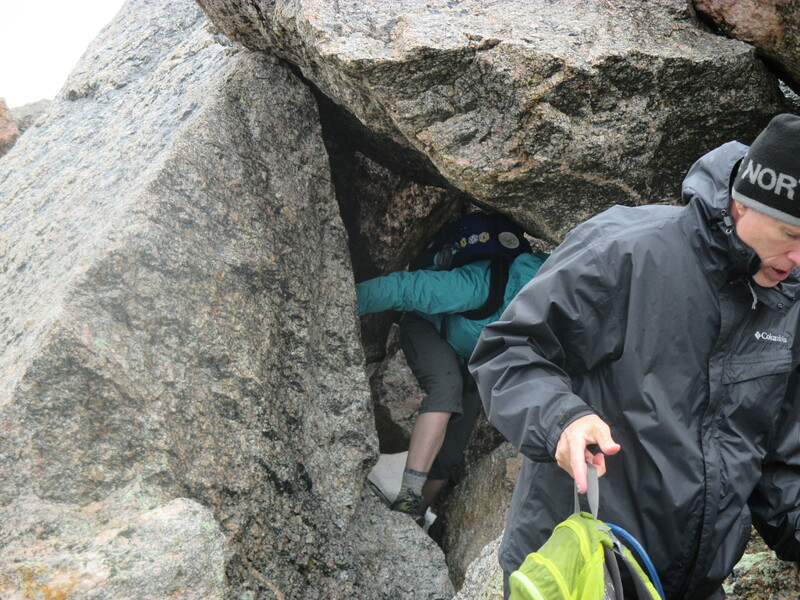 We took a 20 minute break at the Boulderfield for some food and water, then continued up to the Keyhole. We arrived there sometime around 8:15-8:30. For those who have never made the climb before, the general outline is as follows. I tried to estimate about how long each section took us, without accounting for some of our longer breaks. 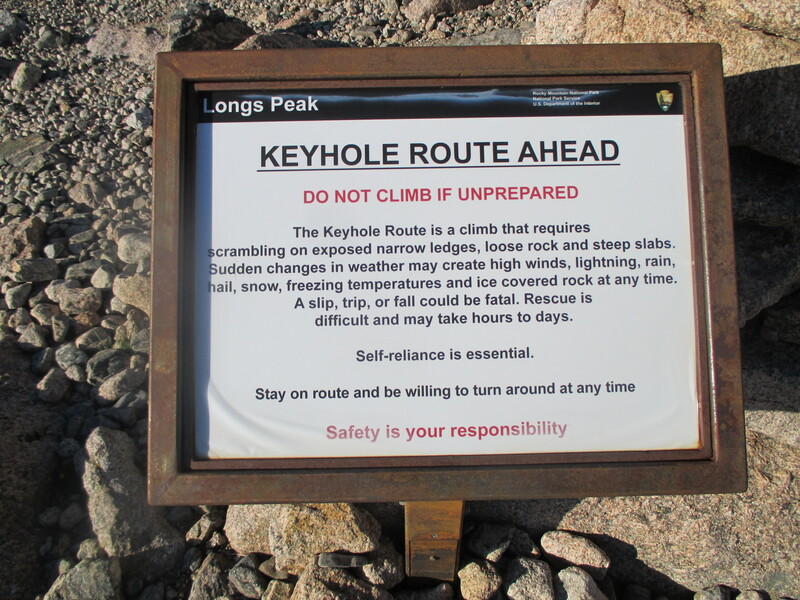 The wind was pretty intense near the Keyhole, but calmed down again as we moved on to the Ledges section of the climb. Same spot, on the way back down. After the Ledges section, we arrived at the bottom of the Trough. I had been reading condition reports throughout the week, and knew to expect about 100-150′ of snowpack blocking the upper section of the Trough. 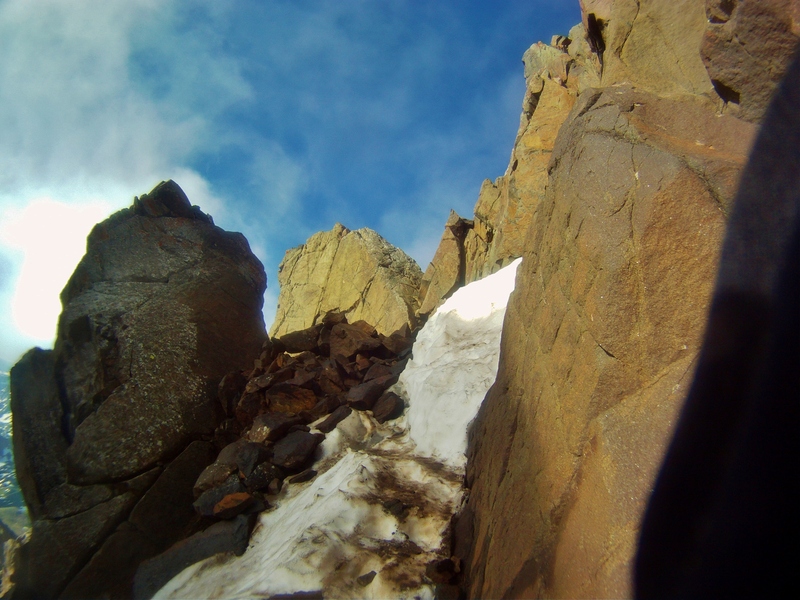 So I had brought my ice axe along, and we had both rented some crampons/microspikes from a local hiking store. Looking up at the snow from halfway up the Trough. Most of the other people we met hadn’t come prepared for the snow, and about 60-70% of them were forced to turn around at this point. 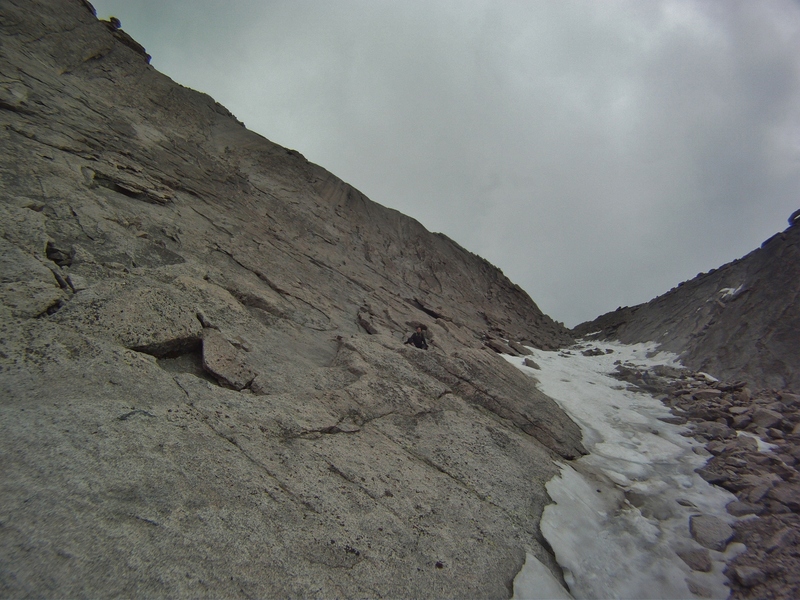 The remainder were able to bypass the snow by climbing up onto some moderately exposed cliffs on the left side of the Trough. Bruce went up first, and I followed after. I joked that if he fell, I would be sure to hand him my ice axe as he tumbled by. But of course we made it up just fine, without any need for a self-arrest. Bike helmet because SAFETY FIRST. 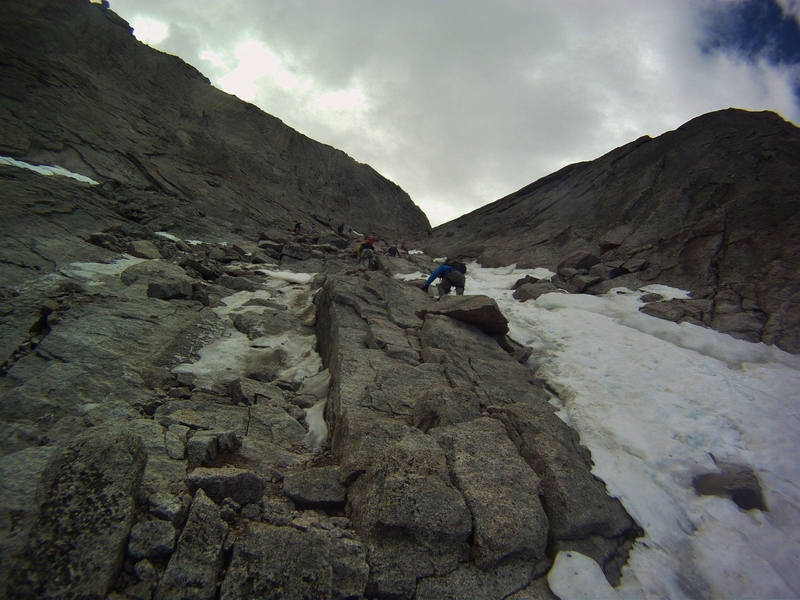 When we reached the top of the snow, there were a few more challenging moves on some steep boulders before we reached the Narrows. Plenty of good handholds, though. A British couple, well-prepared for the snow. Looking back down on the Trough. 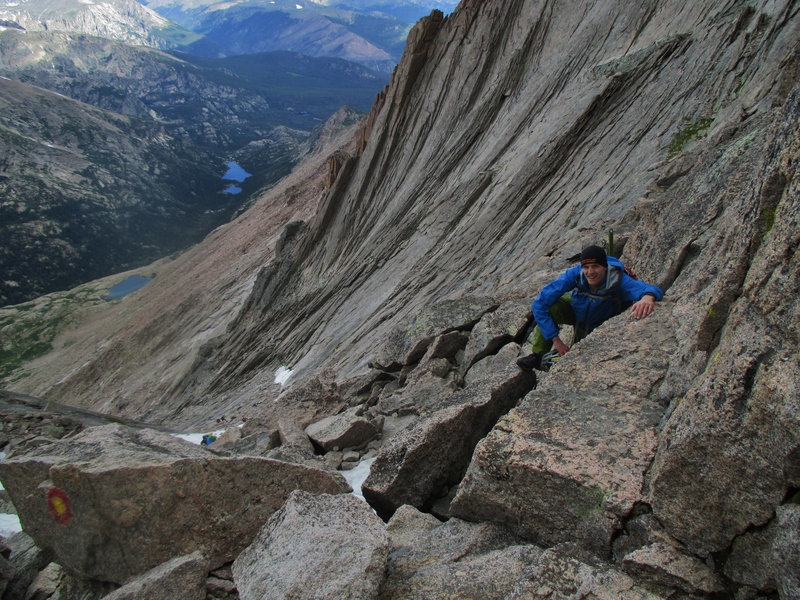 The Narrows section is very similar to the Ledges section: easier scrambling, but more exposure. The rock was dry, so it was pretty straightforward. Navigating the Narrows (on the return trip). 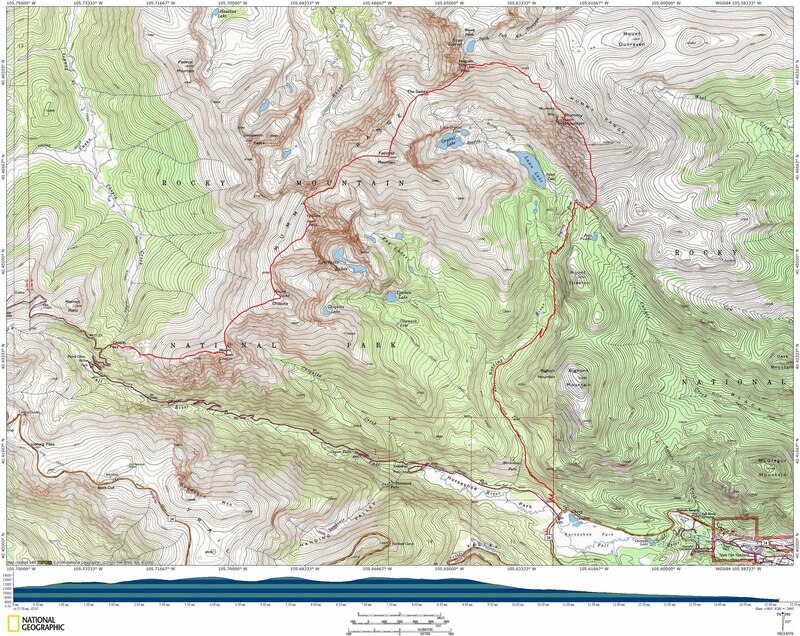 Looking back at the Narrows from bottom of the Homestretch; route in red. 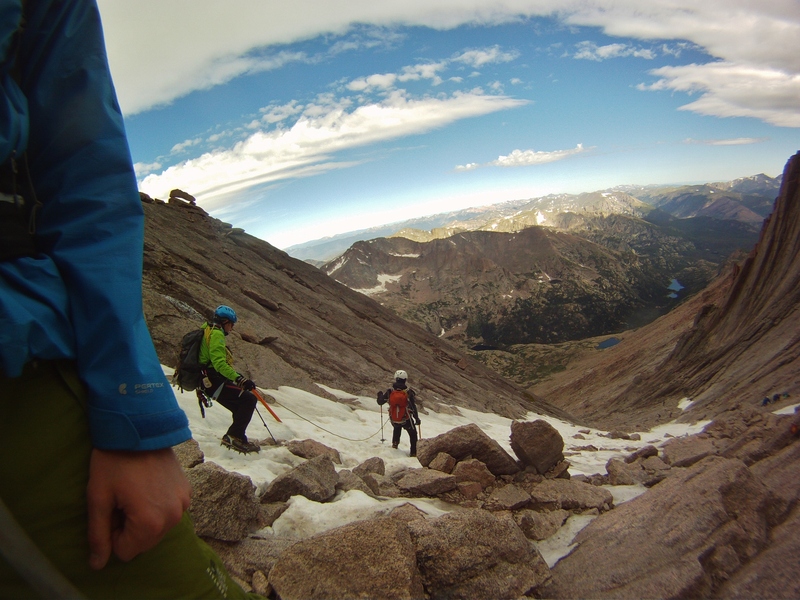 The final push to the summit is called the Homestretch. It’s a pretty steep climb that’s easy when dry and potentially deadly when wet. Today it was dry. Looking up at the Homestretch; route in red. Top half of the Homestretch. We had left the trailhead at 4:55 am and made the summit at 11:11 am. Took a few pictures, ate a few snacks, then started back down at 11:42 am. The return trip was mostly uneventful. 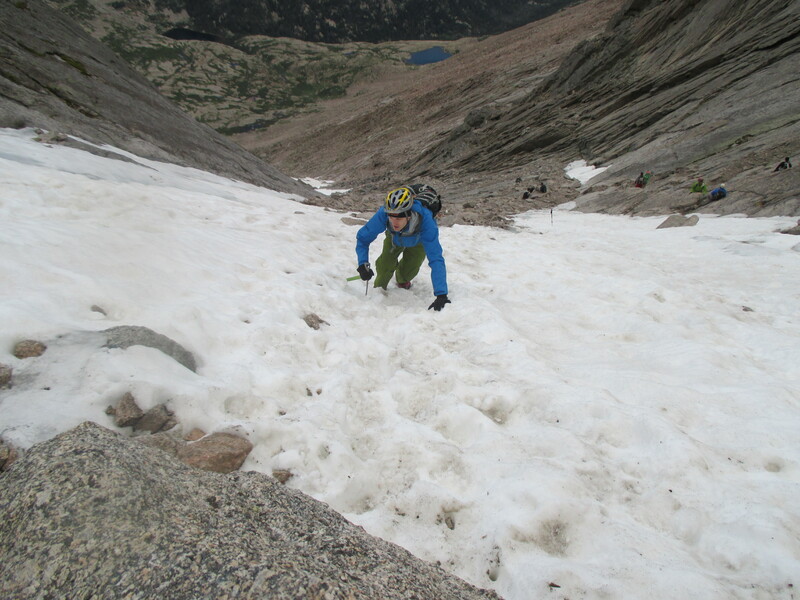 The snow section was more difficult going down than it was going up, and I relied on my axe quite a bit for stability. Bruce hadn’t brought an axe, and opted instead to descend those cliffs I mentioned earlier. Which I don’t envy him for. But he didn’t fall, at least. Bruce coming down the cliffs. Made it back to the trailhead at 5:50 pm for a total trip time of 12 hours, 55 minutes. 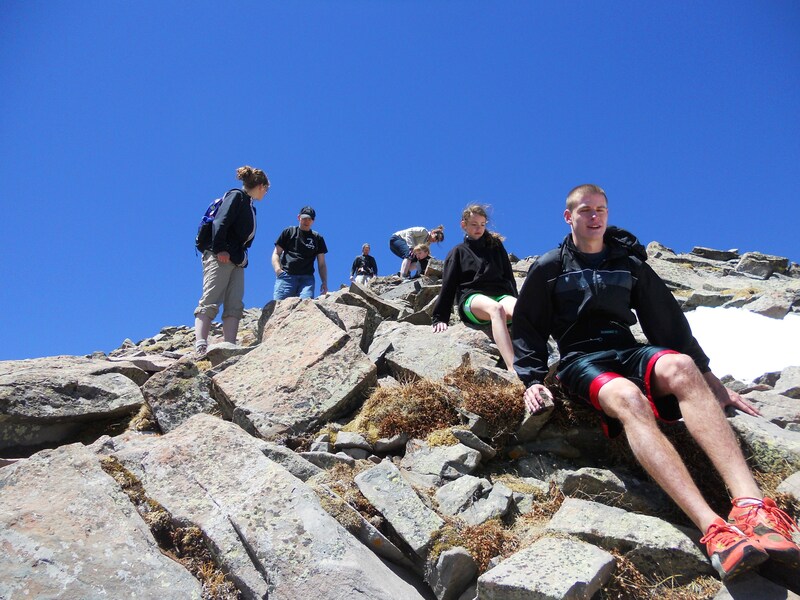 On 7/22/15, Allison, Bruce and I decided to attempt the Mummy Range Traverse (aka “Mummy Mania”) in Rocky Mountain National Park. 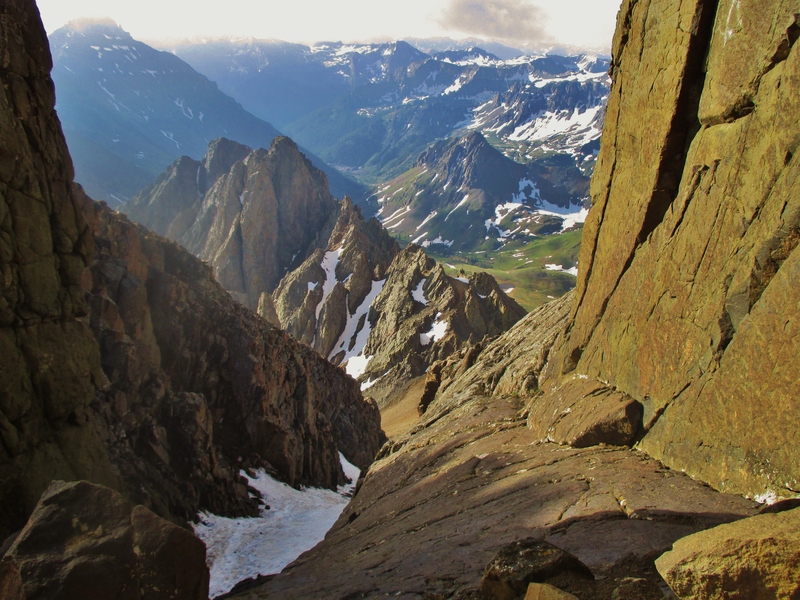 This route hits all six of the major peaks in the Mummy Range, and covers approximately 17 miles and 6000′ of elevation gain. Allison’s mom stayed back with Micah, and also volunteered for drop-off and pick-up. 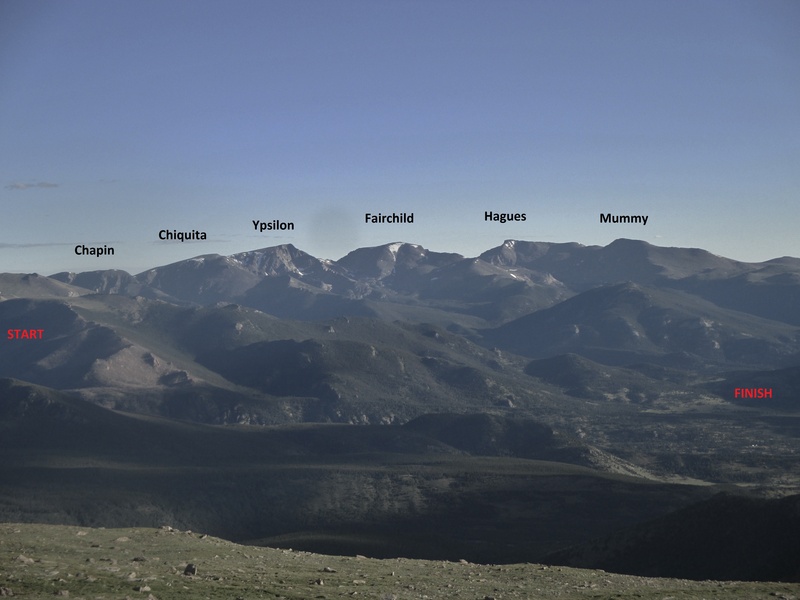 The Mummy Range, viewed from Long’s Peak. Start & finish locations marked in red. 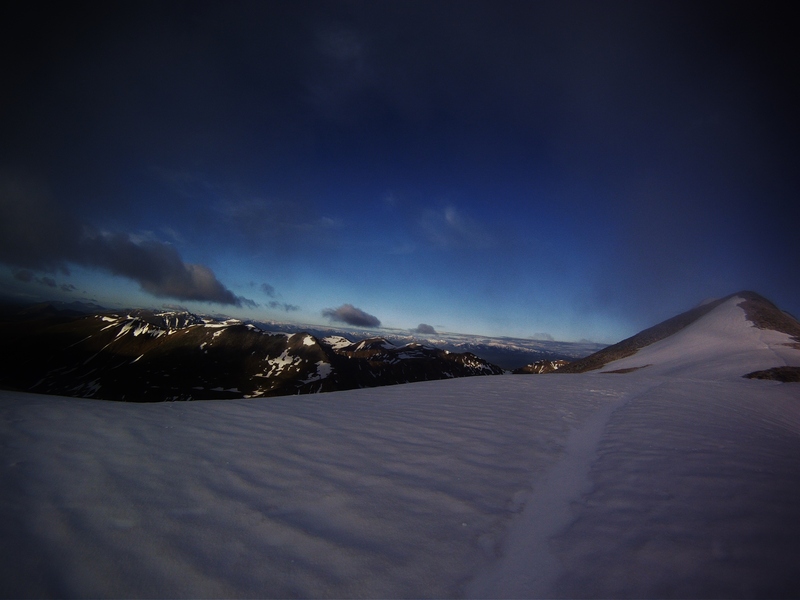 We left from Chapin Pass at 4:30am, followed a trail for a mile or so, then began cutting up the gradual grassy slope of Mt. Chapin (12,454′). 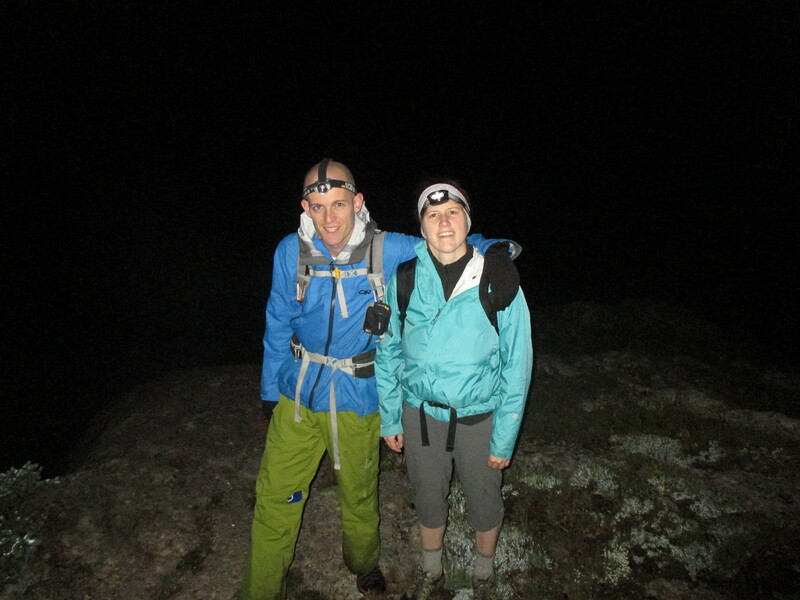 Only needed headlamps for 30-40 minutes before the sun started coming up. 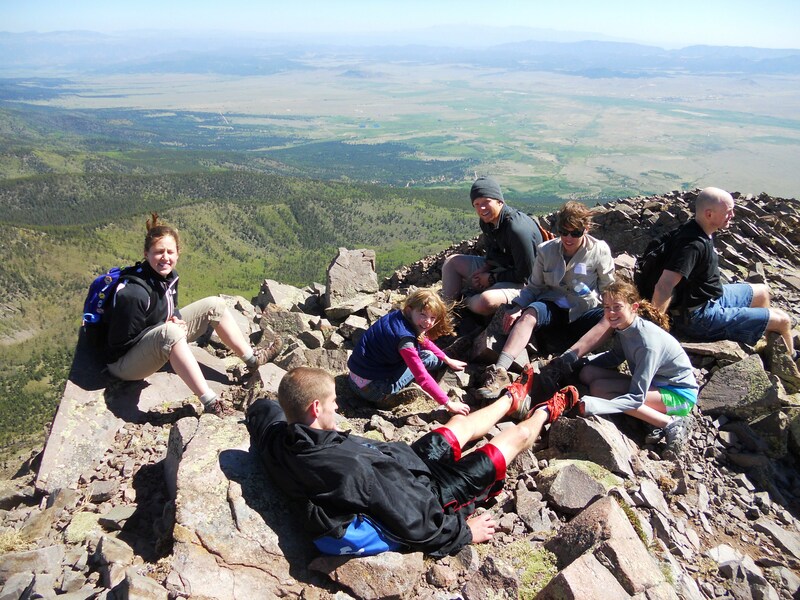 I had read several trip reports online, many of which mentioned how easy it is to overshoot Mt. Chapin by not staying far enough south on the approach. We ended up overcompensating somewhat…hitting every single high point along the ridge…thinking to ourselves, “maybe THIS is Mt. Chapin” on each one. After about 1 hour 20 minutes, we reached the true summit. From Chapin, we continued northeast toward Mt. Chiquita (13,069′). This was a pretty straightforward section – a few hundred feet of descent followed by 1000′ or so of steady climbing to the summit. We saw a handful of other hikers along the way, as the Chapin-Chiquita-Ypsilon route is a fairly well known out-and-back day hike. 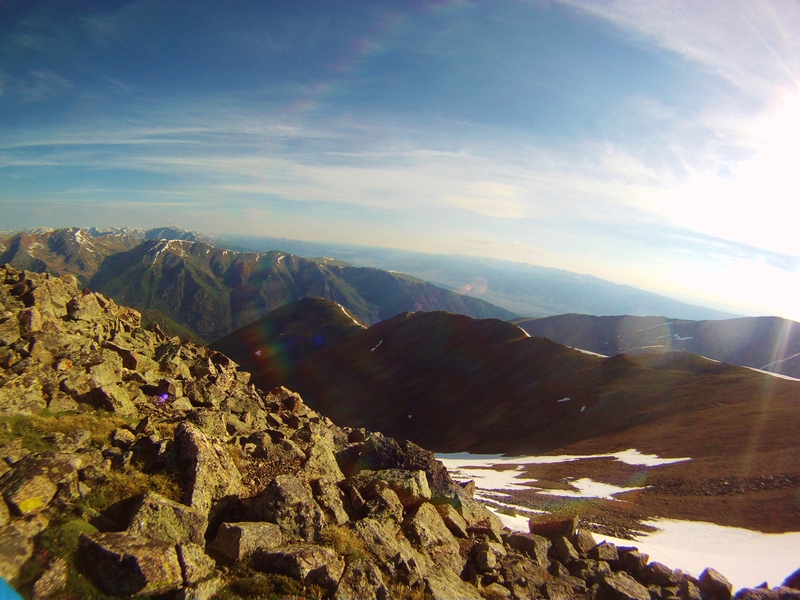 View from the top of Chiquita, looking northeast toward Ypsilon. The terrain was relatively gentle, and we were making reasonably good time at this point. 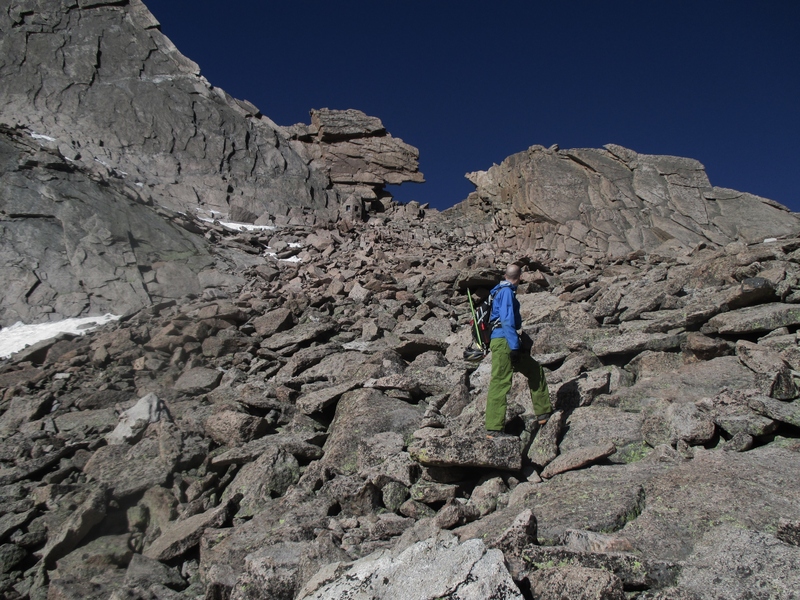 After dropping down to the Chiquita-Ypsilon saddle, we made the summit of Ypsilon Mountain (13,514′) sometime around 9:15 am. 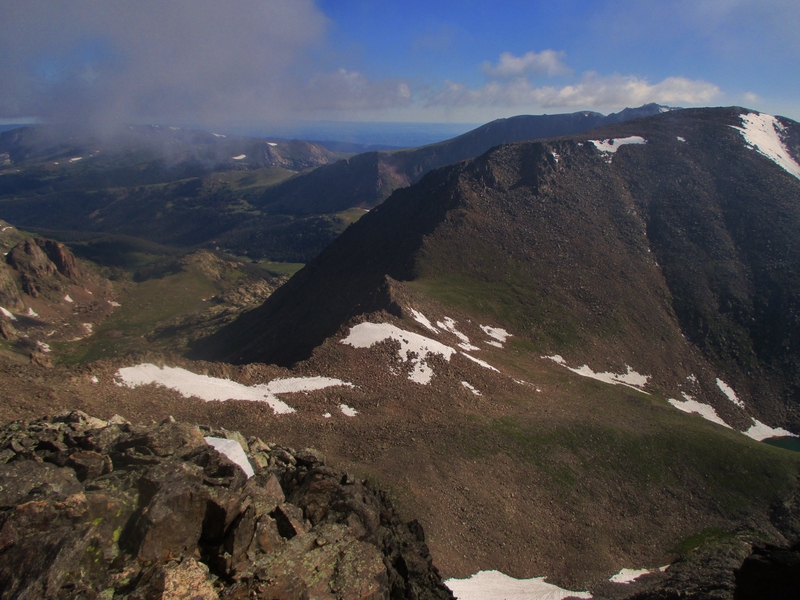 The ridge to Fairchild, seen from the summit of Ypsilon. 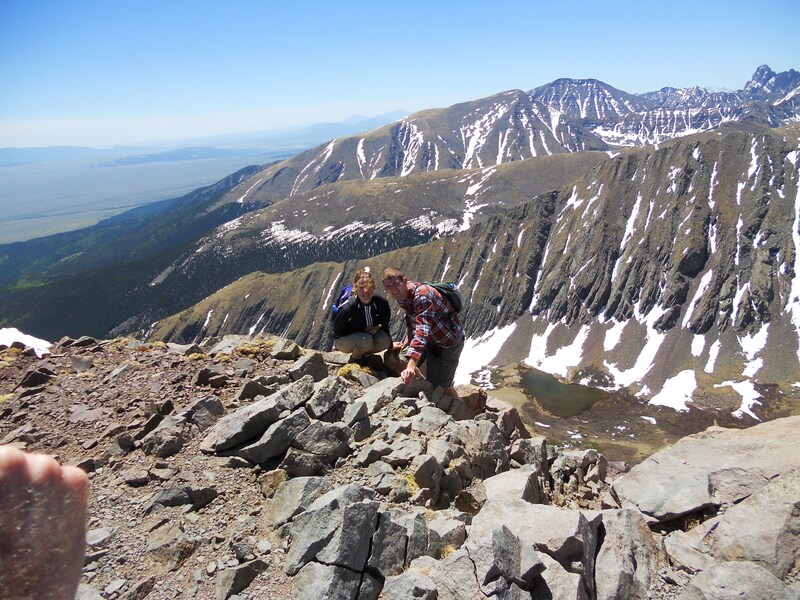 We took a short break on the summit of Ypsilon, then started toward Fairchild (13,502′). 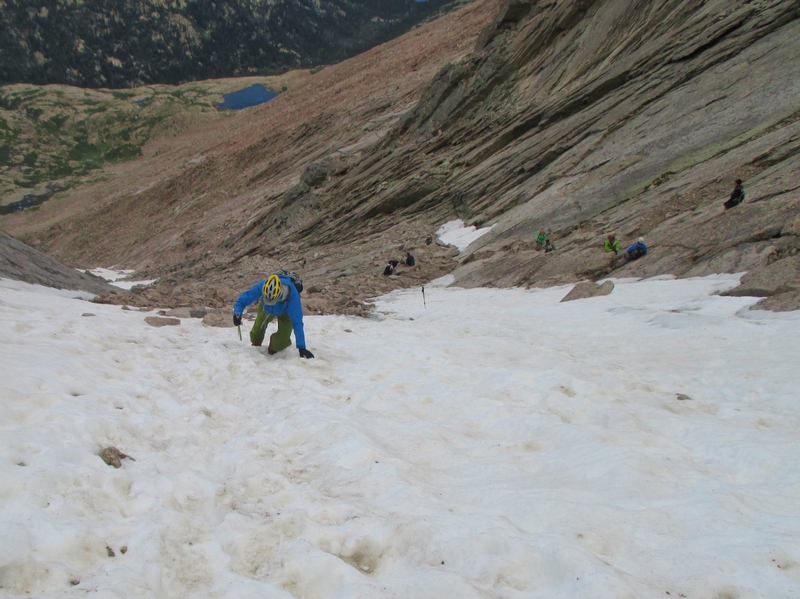 At this point, the terrain became significantly tougher. 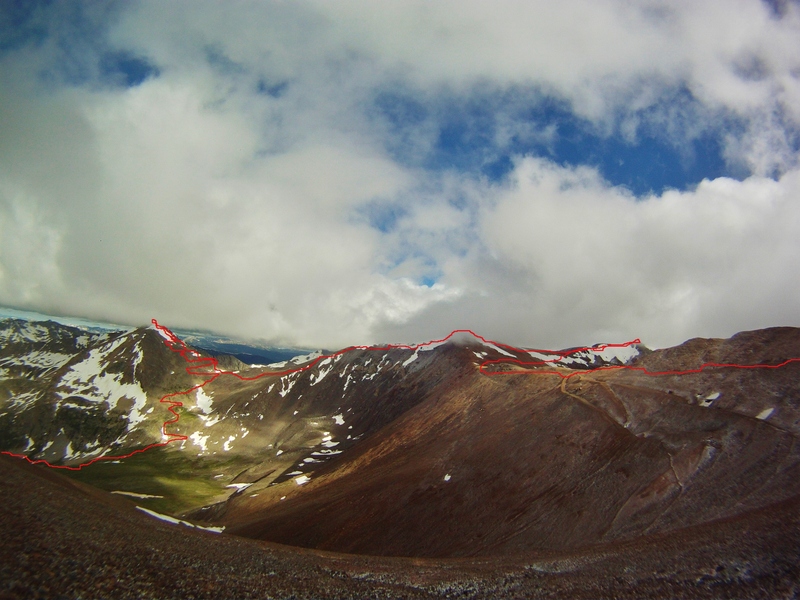 We opted to avoid the nasty-looking ridgeline to Fairchild, skirting it to the south by dropping down a scree slope. 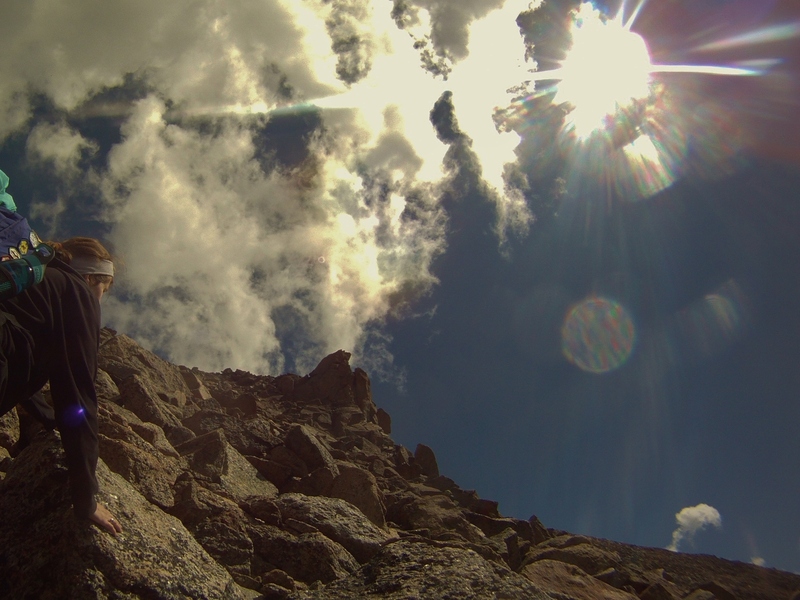 Allison and Bruce descending Ypsilon. 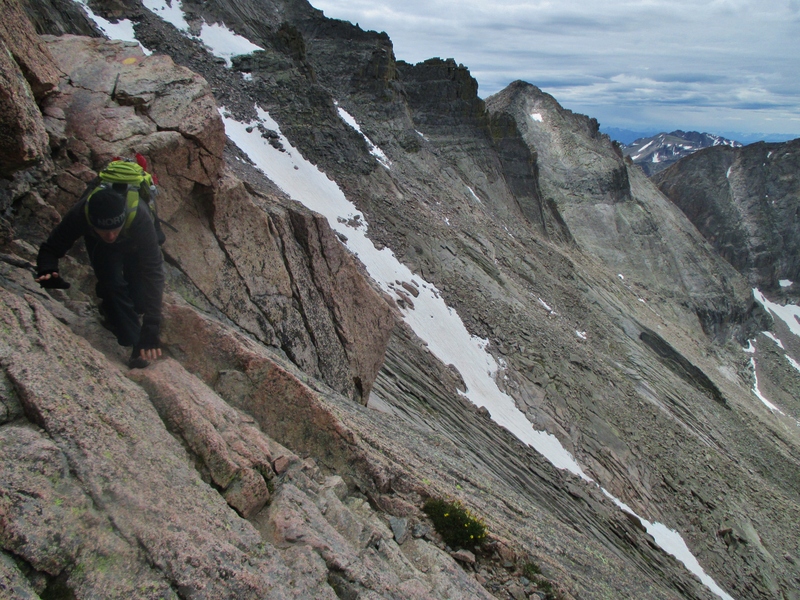 Climbing Fairchild; Ypsilon in background. 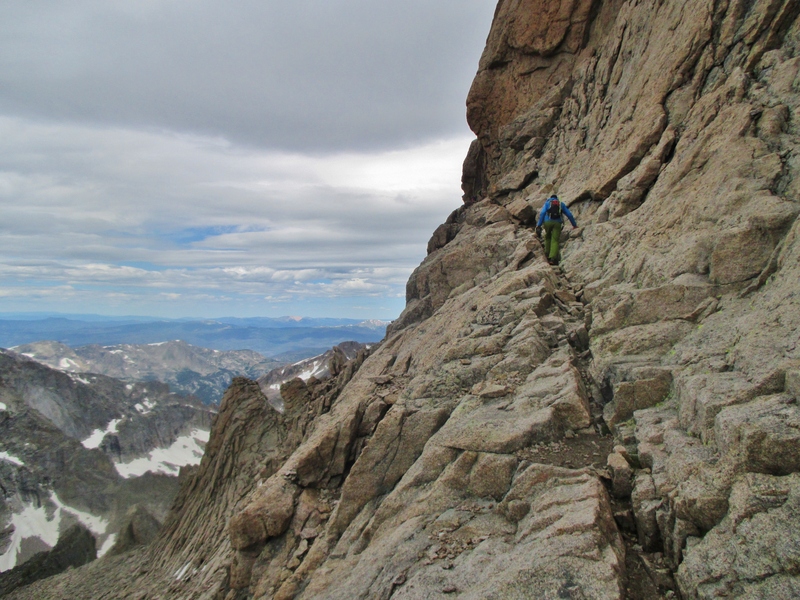 The easiest route up Fairchild goes directly between two rock ribs, one of which can be seen here. During the climb, we could see some rain building off to the west. 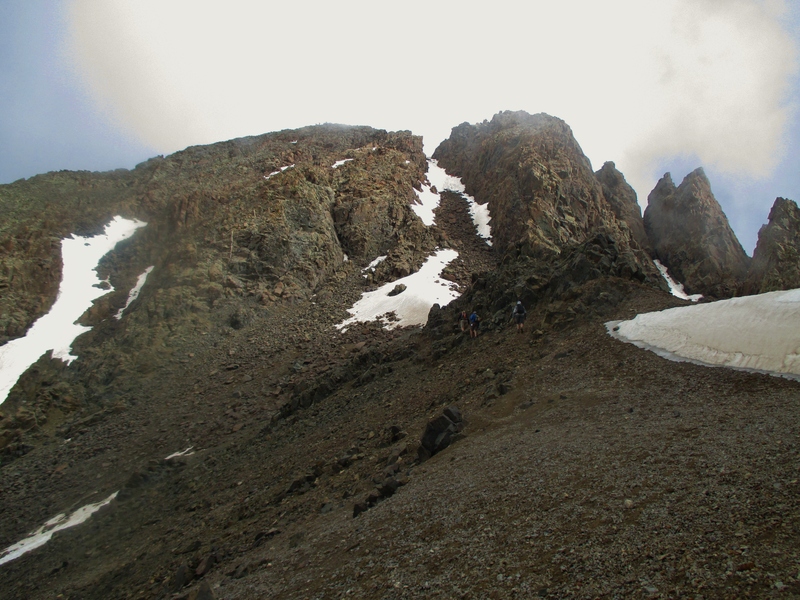 It hit just as we reached the upper slopes of Fairchild, and we ended up losing about an hour cowering under some rock slabs to avoid the rain/hail/snow/lightning. Leaving the rock caves after the storm. By the time we made it over Fairchild and into the saddle on the opposite side, it was getting late in the day. We had only left Lisa with a 12 hour supply of milk for Micah, so Allison and Bruce decided to start heading back down the valley. 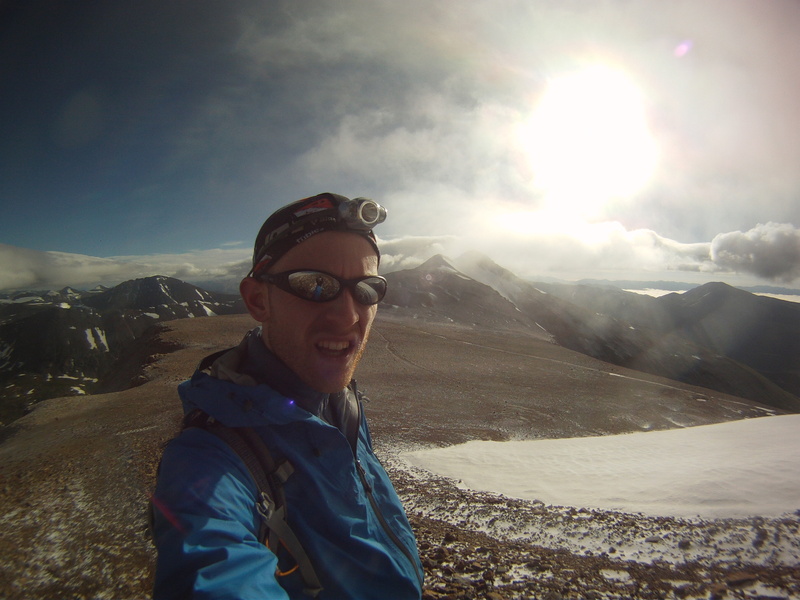 I opted to tackle the last two mountains solo. 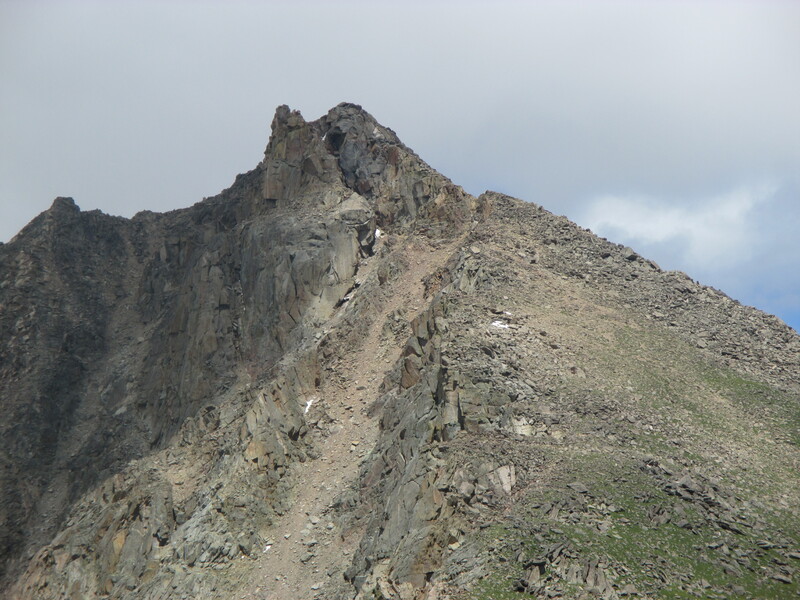 Hagues Peak from the Fairchild-Hagues saddle. 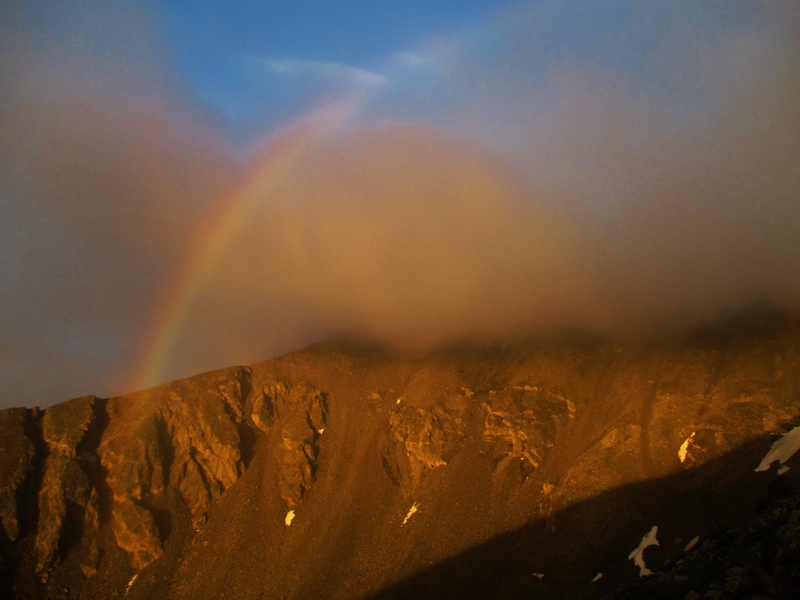 I lost another 1.5 hours waiting out two more thunderstorms on Hagues Peak (13,560′). 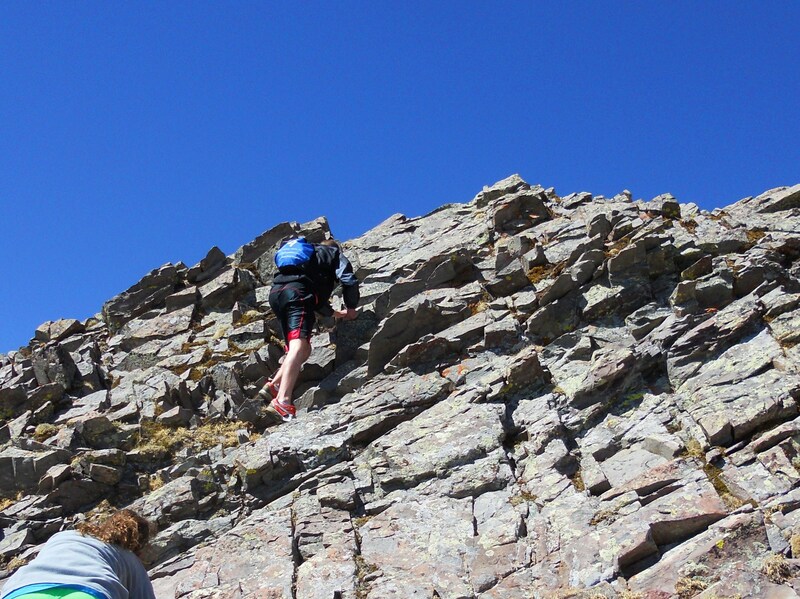 The rock got pretty slippery, which made the final 50′ of class 3 scrambling a little challenging. Closer look at the top of Hagues. 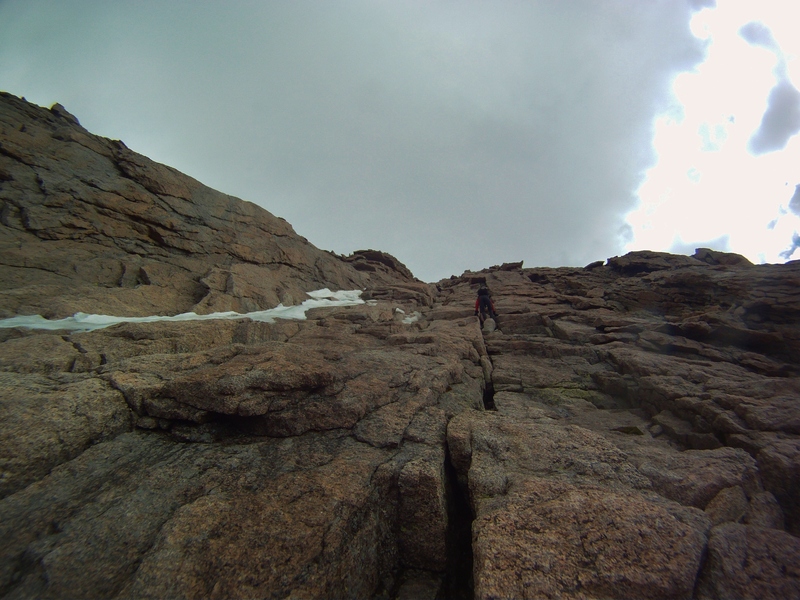 The ridge from Hagues to Mummy Mountain (13,425′) involved a long stretch of wet, slippery boulders. Looking toward Mummy (right of center) from Hagues. Mummy Mountain itself was an easy climb. After reaching the top, I started the long descent down the southeast ridge to meet back up with the hiking trail in the valley. Looking back up at Mummy Mountain from the valley floor. Once I regained the trail, the final 6 miles took a little less than 2 hours. Ended up having to get the headlamp back out for the final 30-40 minutes. Allison and Bruce had finished around 6:15-6:30 pm. I didn’t make it back to the Lawn Lake TH until 9:30 pm…for a grand total of 17 hours. It definitely would have gone faster without all the storms, but that’s the way these things go. 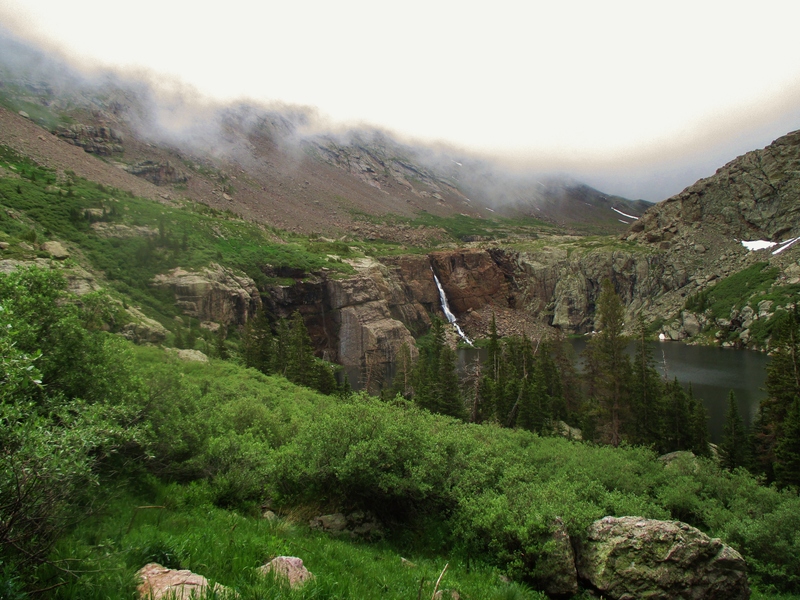 My final day in Colorado was 7/9/15 – coincidentally, Allison and I’s five year wedding anniversary. 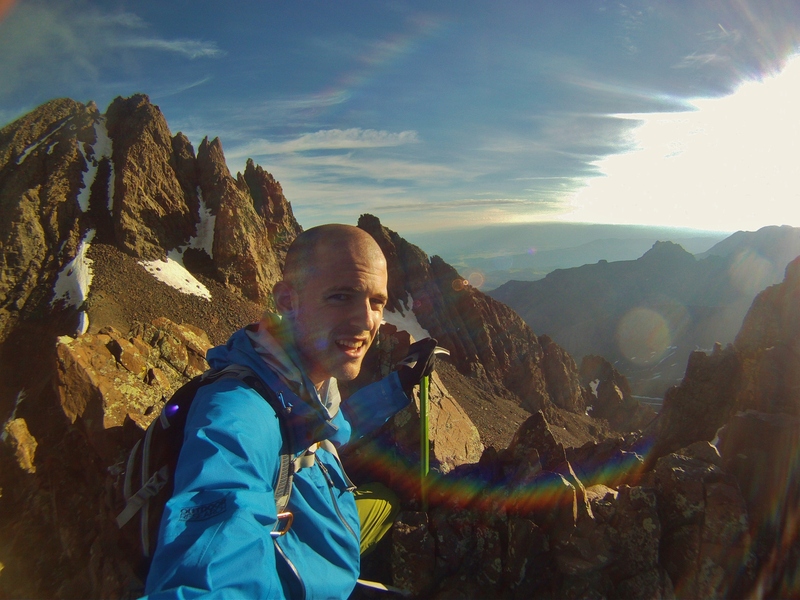 My plan was to climb as many 14,000′ mountains as possible, in as little time as possible. 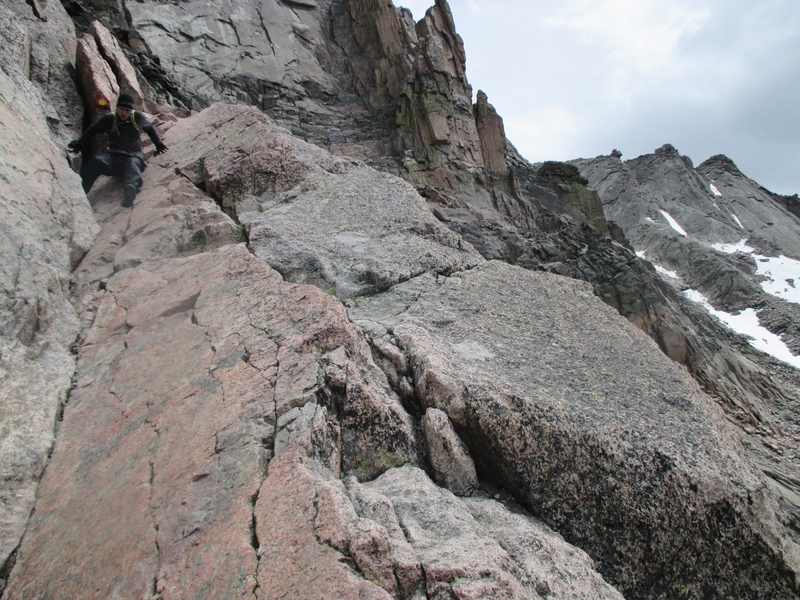 The obvious choice was the ever-popular “DeCaLiBron” route. The loop includes Mt. Democrat (14,155′), Mt. 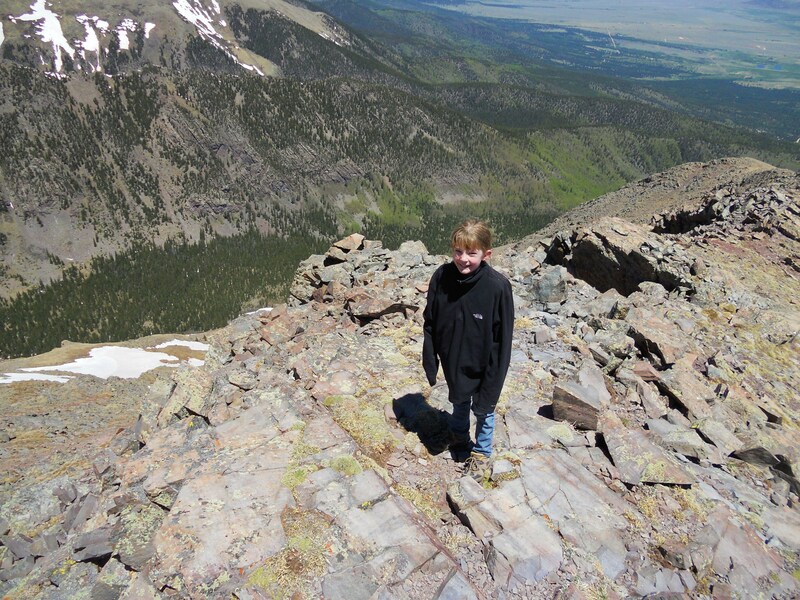 Cameron (14,238′), Mt. Lincoln (14,293′), and Mt. Bross (14,177′). 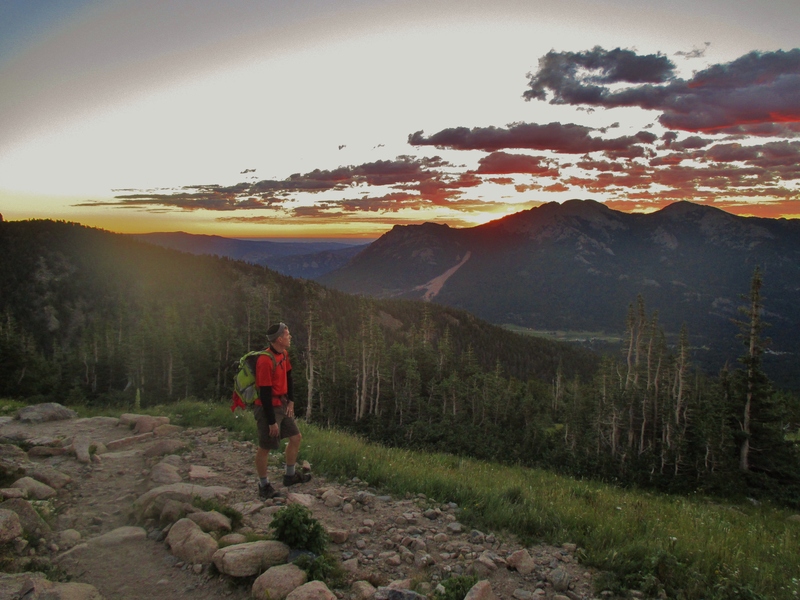 In order to avoid the inevitable crowds, I started from the trailhead at 4:00 am. 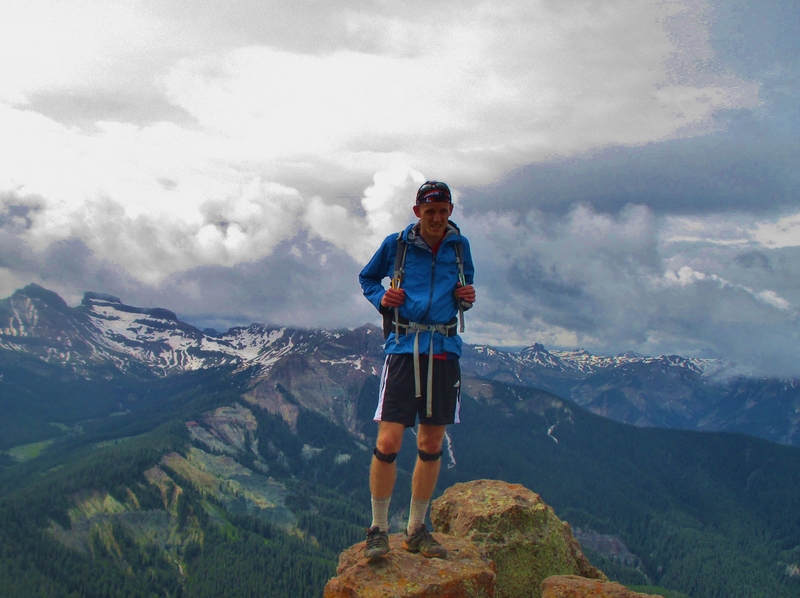 My goal was to finish in under four hours, and with some energetic climbing and occasional ridge-running, I eventually made it back to my car with a time of 3 hours 58 minutes. For what it’s worth, the access road was fairly rough. 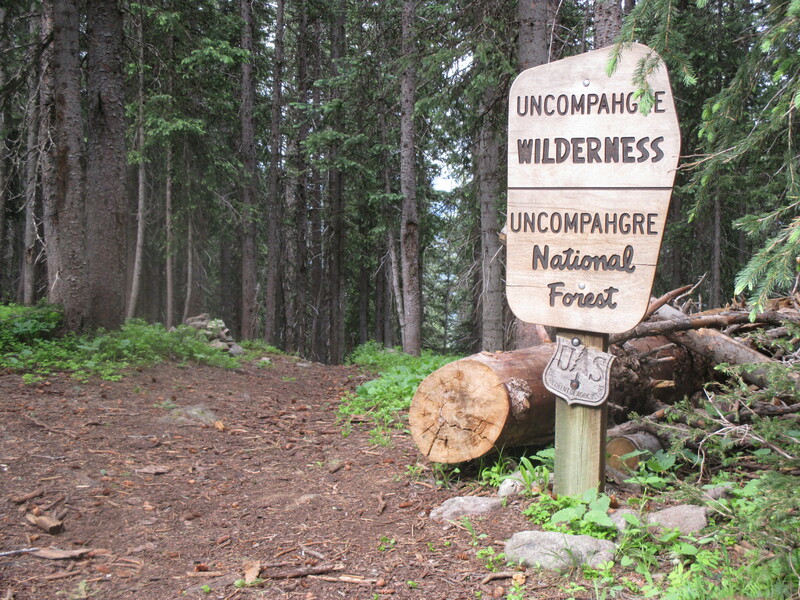 I was able to reach the trailhead with our Honda Fit, but only with a little…um…creativity. When I returned later in the morning, all the other vehicles at the trailhead were Jeeps and trucks, and a string of cars and vans could be seen parked about a half mile further down the road. Pre-dawn light from the Mt. Democrat summit ridge. Like most people, I opted to do the loop clockwise, starting with Mt. Democrat. I reached the summit in a little under 90 minutes, and stopped for a short snack & coffee break while I watched the sunrise. The early start paid off, as I had the mountain completely to myself. Sunrise view from Mt. Democrat. Retracing my steps across Mt. Democrat’s snowfield. 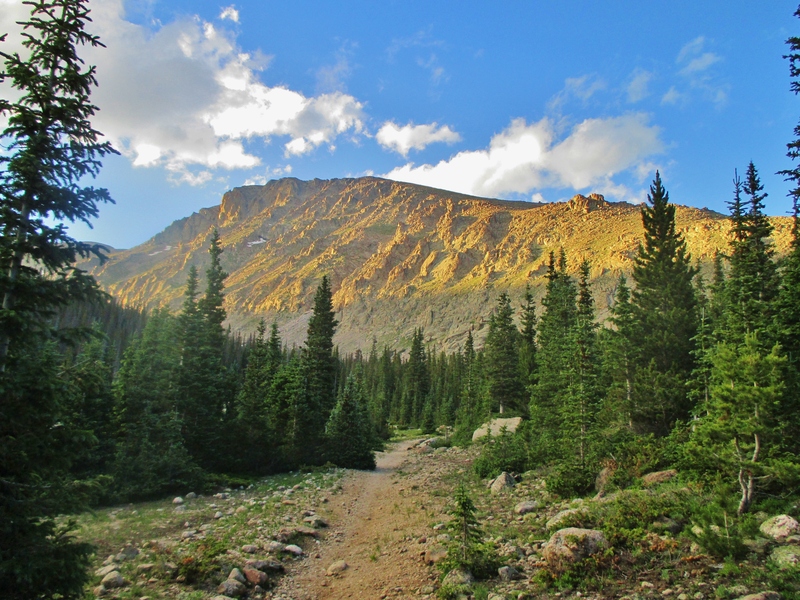 When I made it back to the Democrat-Cameron saddle, a large caravan of hikers could be seen leaving the trailhead. Not to beat a dead horse, but if you want to make the most of this hike I strongly recommend starting early. View of Mt. Cameron from the lower slopes of Mt. Democrat. From the saddle, the climb to the top of Mt. Cameron was short and straightforward. 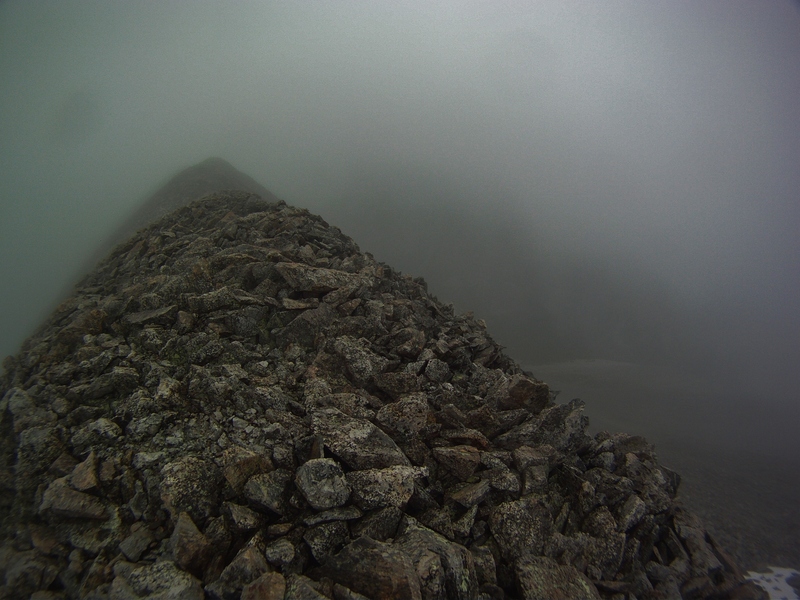 It’s a very exposed ridge, and the wind was gusting at 50+ mph. Another look at Mt. Lincoln. Mt. Lincoln was another short climb, with only one short section requiring me to use my hands. 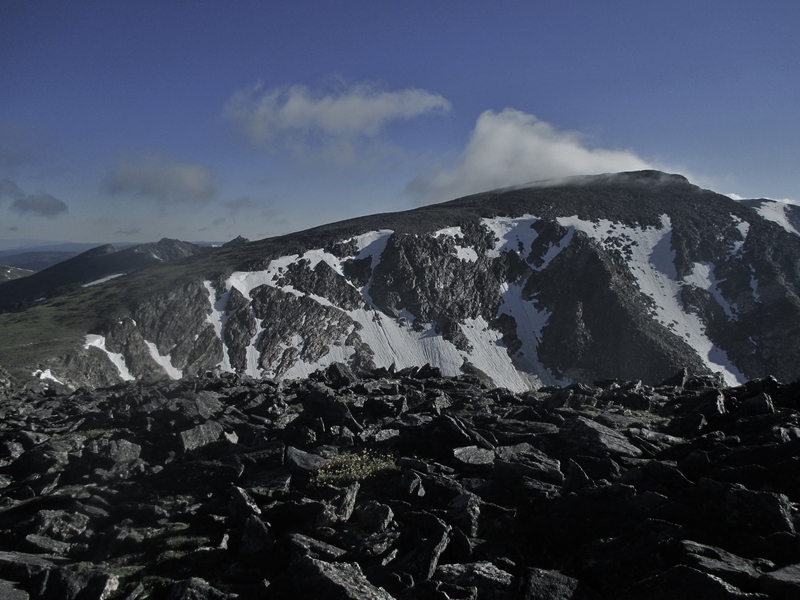 From Lincoln, the route to Bross involved a long, broad ridgeline. In order to “cancel out” a few of my snack breaks, I jogged it at about a 9:00/mile pace. 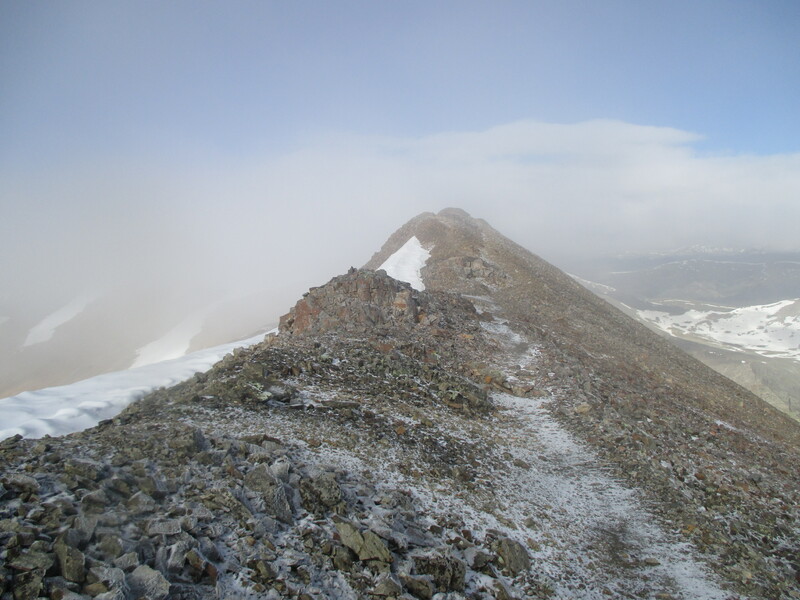 Ridge leading to Mt. Bross. View from the slopes of Mt. Bross…Mt. Democrat, Mt. Cameron, and Mt. Lincoln can be seen (L to R). The end of the hike meant the end of the trip. I spent the rest of the day driving to Omaha, Nebraska, where I stayed the night with my aunt and uncle before picking Allison & Micah up at O’Hare airport the next day. 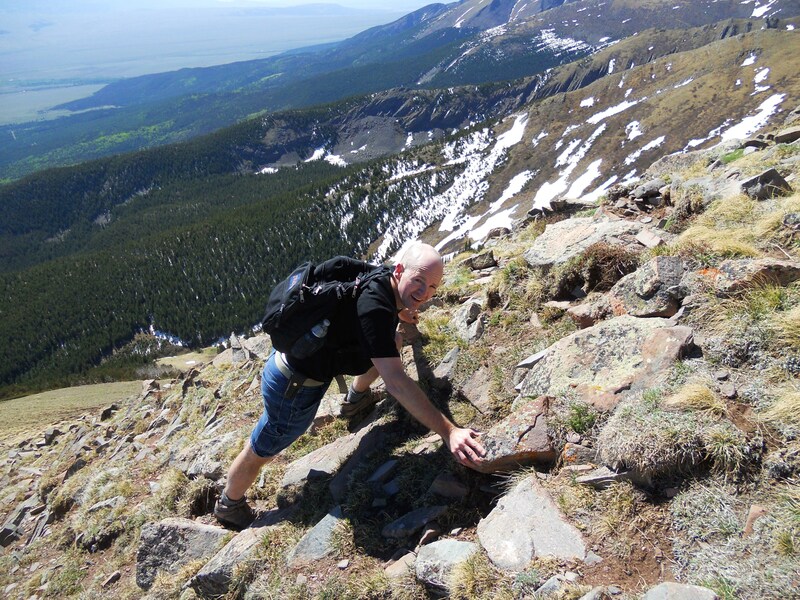 As mentioned in the previous post, my carefully-laid plans to tackle some 14ers in the Sangre de Cristo range had been shot to pieces by a forecast full of thunderstorms. 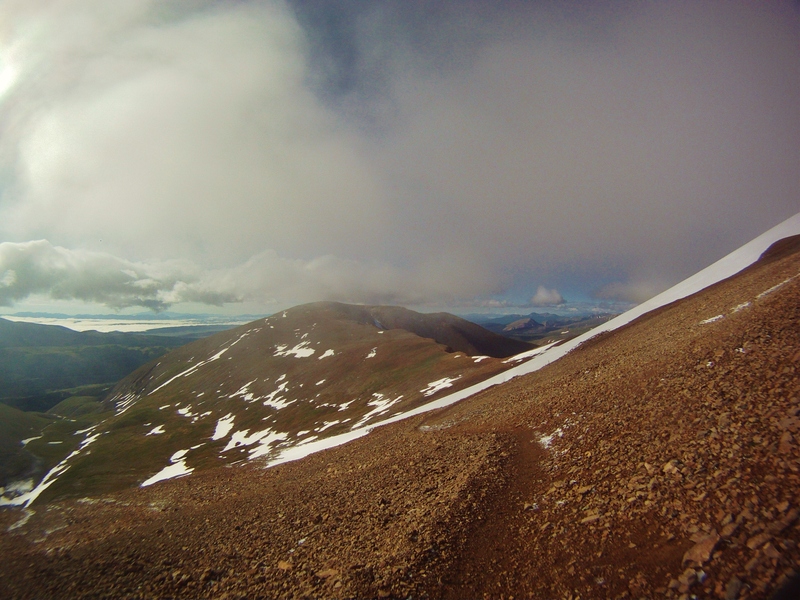 The weather in the Sawatch Range wasn’t much better, but I knew that these mountains at least had shorter approaches. So at the (literal) last minute, I settled upon Mt. 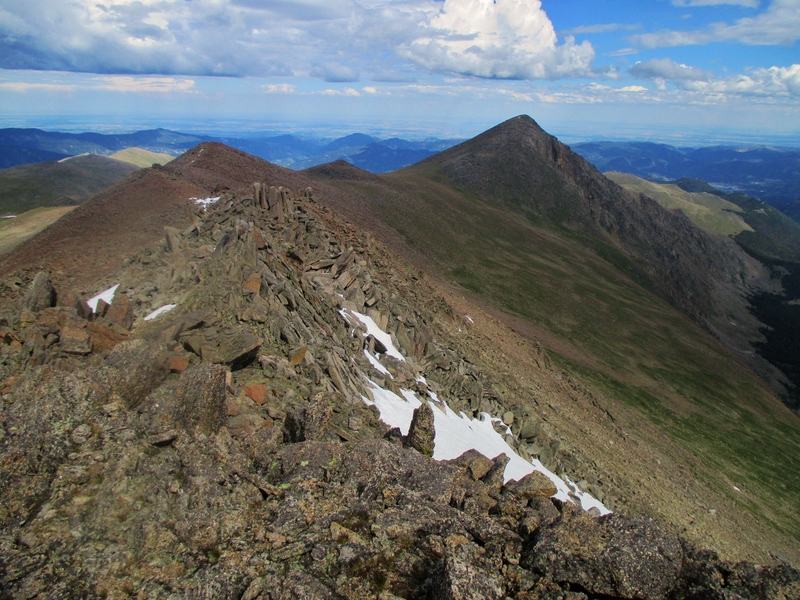 Shavano (14,229′), Tabeguache Peak (14,155′), and Esprit Point (13,637′) for my 7/8/15 climb. I knew that my only hope for bagging all three peaks would be to start very early. Thunderstorms were projected to roll in around 1:00 pm. So I awoke at 2:30 am and was hiking by 3:45 am. The first hour-and-a-half or so was completely silent, almost completely dark, and more than a little eerie. No other cars at the trailhead, and no other people on the trail. I gave a loud shout once every couple of minutes to keep from accidentally sneaking up on a bear, and kept my can of pepper spray in my front pocket. The sun broke over the horizon just as I reached treeline. Sunrise peaking through the clouds. I heard a few distant rolls of thunder, but nothing that seemed too close. So I continued upward. Looking across toward Esprit Point. 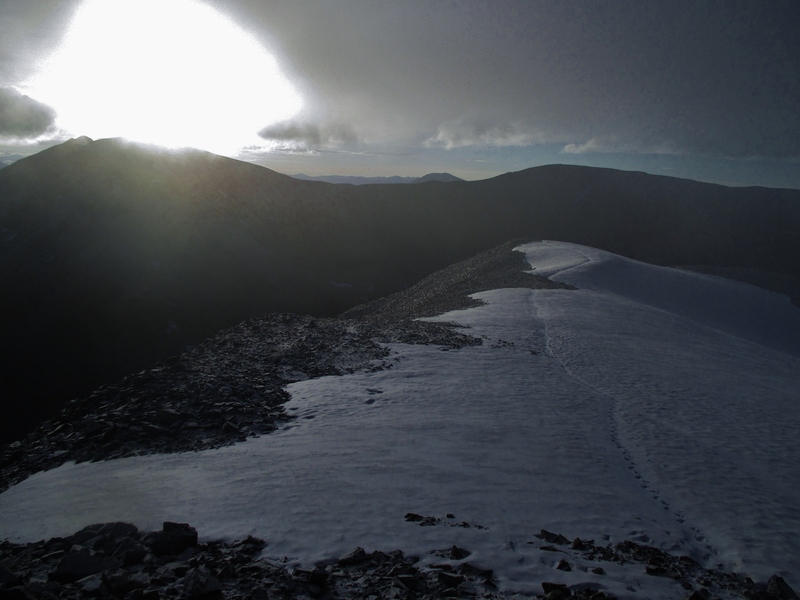 When I reached the Esprit-Shavano saddle, I turned right and followed the faint path to the summit of Mt. Shavano. 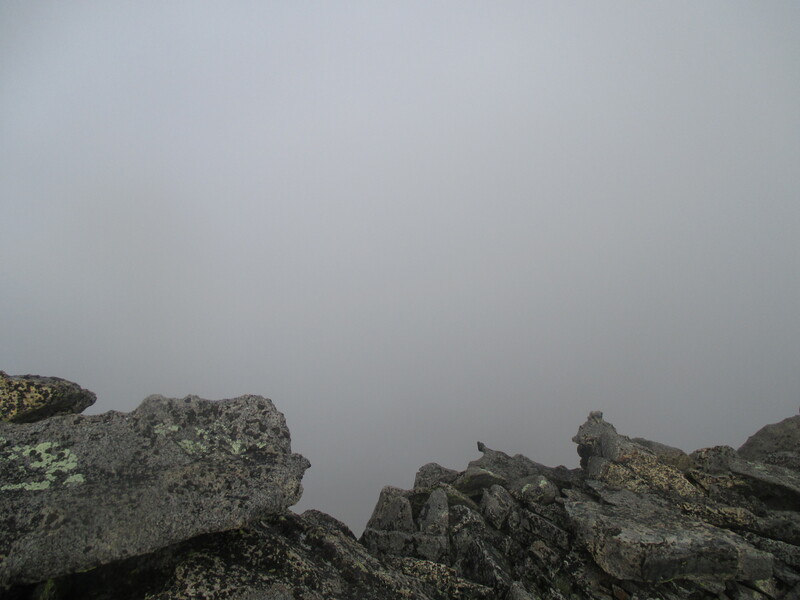 The views from the top were completely obscured by cloud. Mt. Shavano, from the Shavano-Esprit saddle. 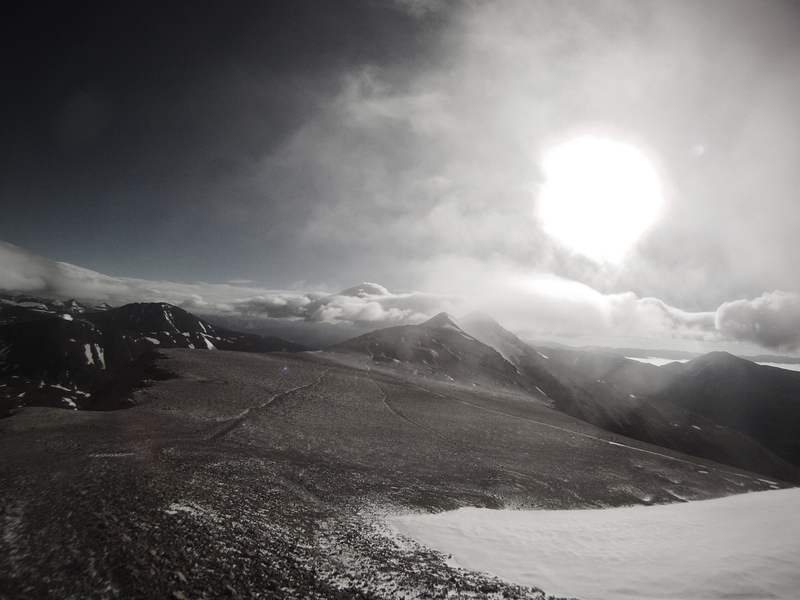 I then backtracked all the way to the Shavano-Esprit saddle, and made the short jog up to the top of Esprit Point. 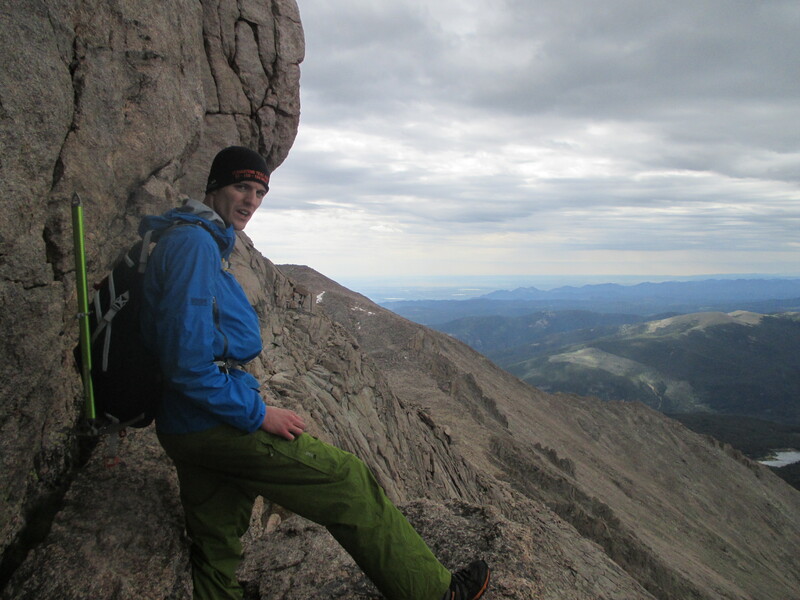 Not the most exciting climb, but it was nice to bag a bonus 13er with such little effort. 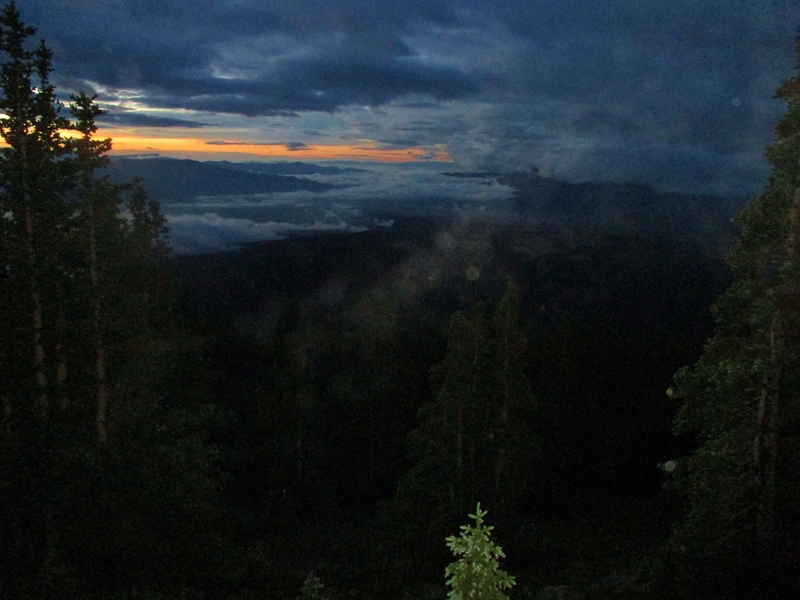 Stunning views of the San Isabel National Forest, off to the right behind those clouds. I made it back to the trailhead around 1:00 pm, then drove up to Frisco, CO for a short night’s sleep in yet another Walmart parking lot. After climbing Mt. 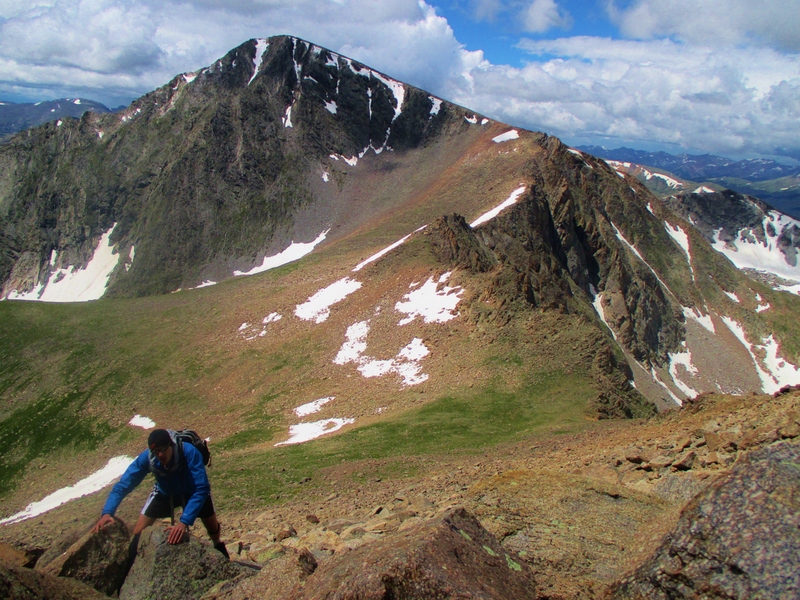 Sneffels on 7/6/15, I made the long drive across Colorado to the Sangre de Cristo range, where I planned to spend the final three days of my trip climbing Challenger Point & Kit Carson (day 1), Ellingwood & Blanca (day 2), and Mt. 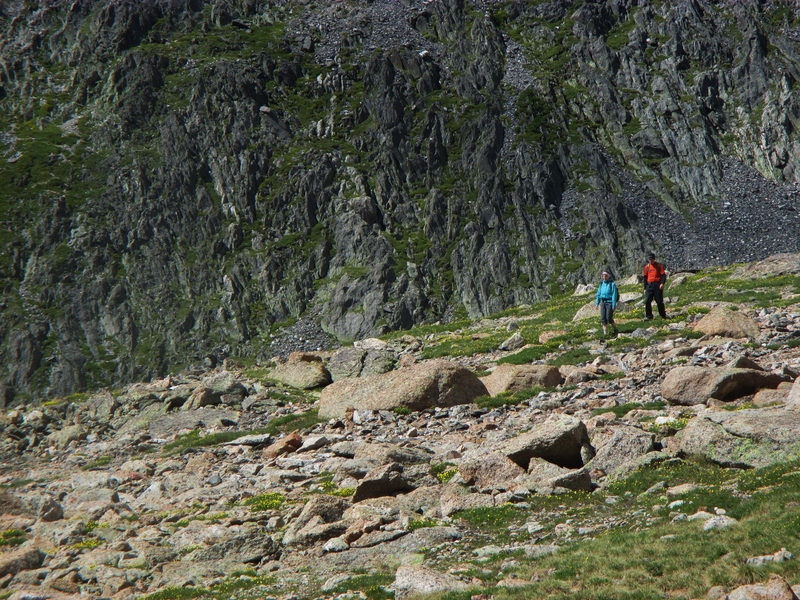 Lindsey & a couple of nearby 13ers (day 3). I also planned to backpack out onto the Great Sand Dunes to camp for a night or two. As it turns out, this wasn’t in the cards. The entire area was forecast to receive a steady barrage of thunderstorms for the next 3-5 days. 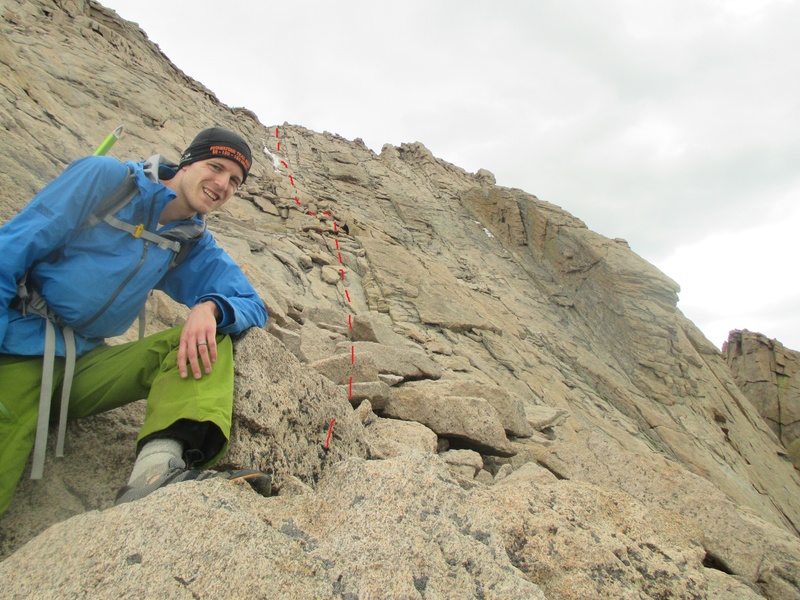 On top of that, the Kit Carson Avenue (a ledge-like route used to access the summit) was reportedly still blocked by a precarious ledge of snow. 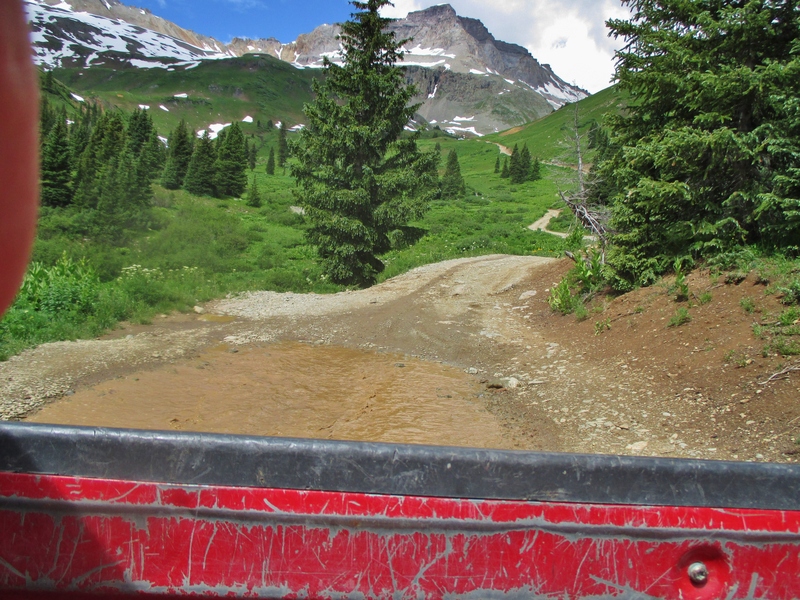 On top of that, the dirt road leading to the Mt. Lindsey trailhead had been completely wiped out by a landslide a few days previously. I reached my hotel in Alamosa on the evening of 7/6 and started working on a backup plan. Since I’d already made the drive to the Sangre de Cristo’s, I figured I would at least make an attempt at Challenger Point & Kit Carson. 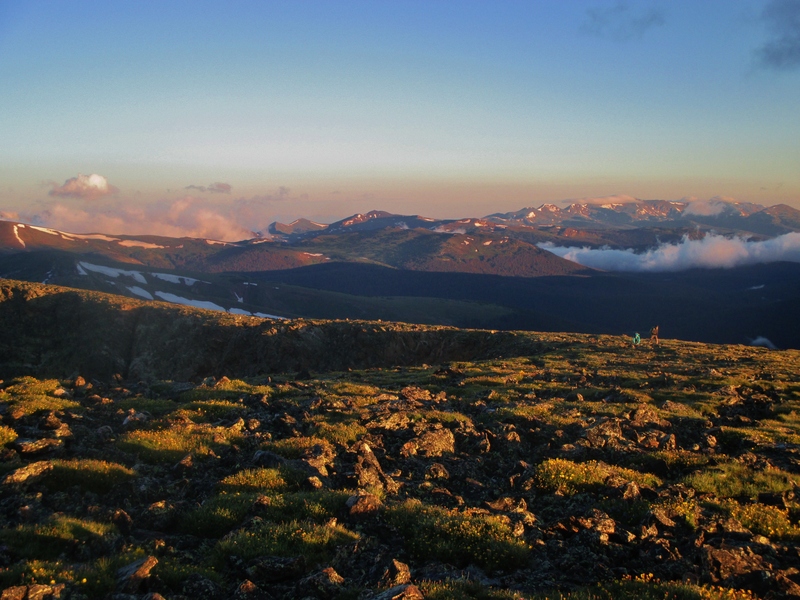 After that, I decided I’d plan to drive north to the Sawatch Range to hopefully bag a few more 14ers. I got a late start o0n 7/7/15, sleeping until 6:00 am and not reaching the trailhead until around 7:30 am. The cloud cover was near-complete at this point, and there were scattered showers throughout the morning, so the views were poor. On the other hand, the crumby weather meant I had the trail practically to myself. The approach involved a ~5 mile steady climb up to Willow Lake. There were two creek crossings along the way. 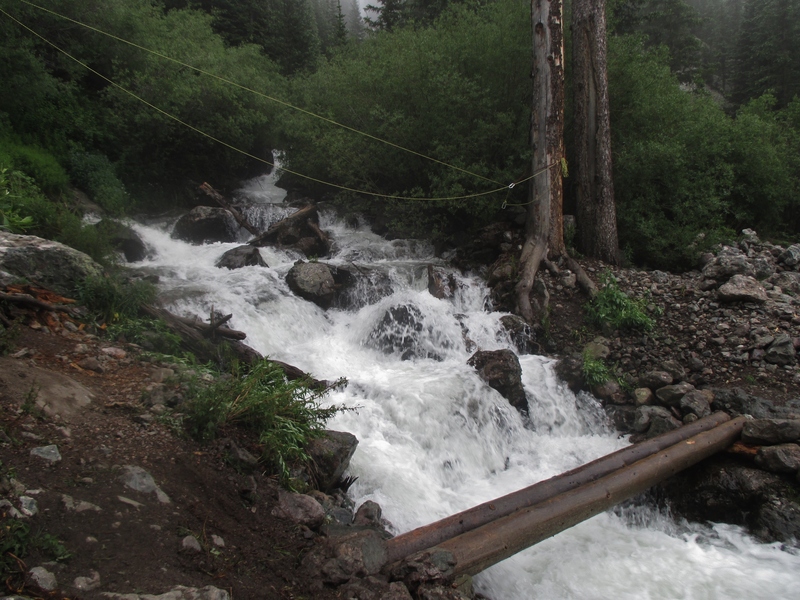 The first crossing had a bridge, but the second involved a thigh-deep wade through rough water. 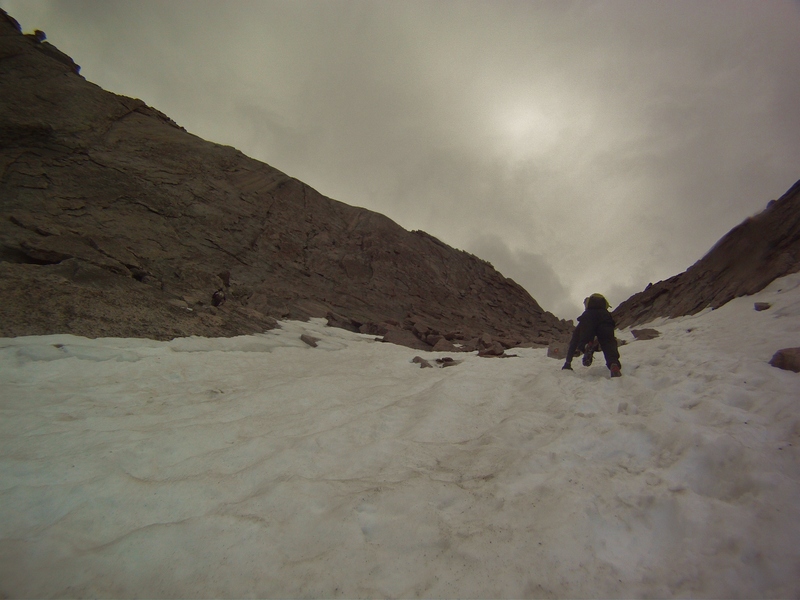 After reaching Willow Lake, I faced a long, steady, 2000′ climb up the north slope of Challenger Point (14,081′). 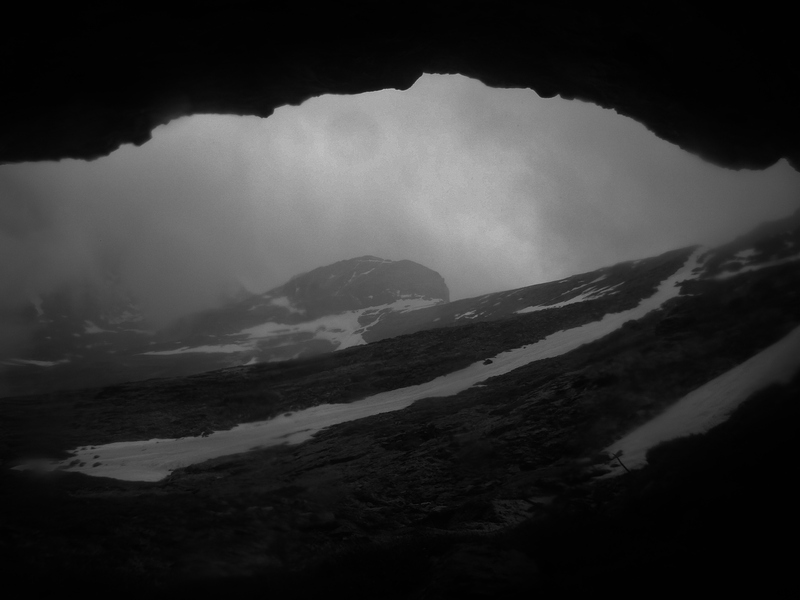 I was within the clouds by this point, so the visibility was extremely poor. Rain seemed imminent, so I ditched my trekking poles (i.e. lightning rods) at the base of the slope and started upward at an aggressive pace. 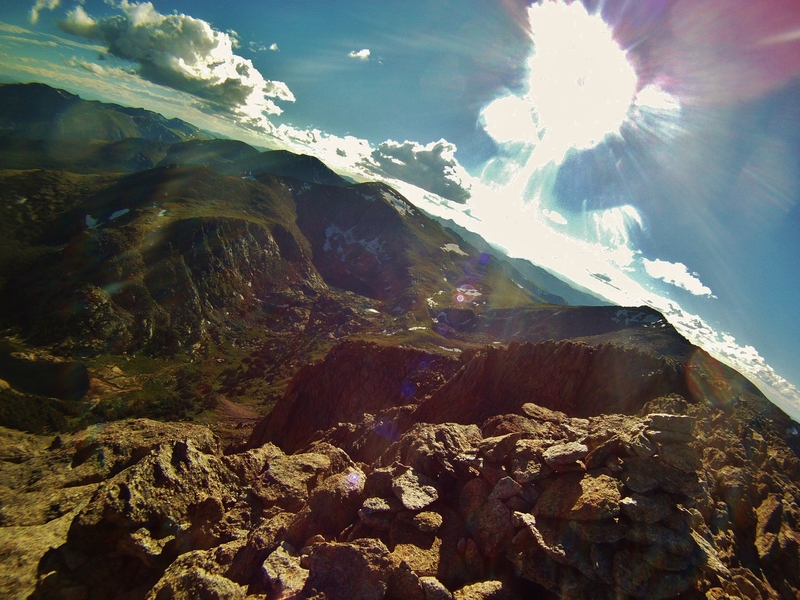 Just as I was approaching the top, I felt a raindrop on the hood of my jacket. Within 20 seconds, I was getting blasted by a downpour of pea-sized hail. This lasted about 20 minutes, and left the slopes covered in 1-2 inches of icy slush. Taking cover under a rocky outcropping. View of Kit Carson through the storm. 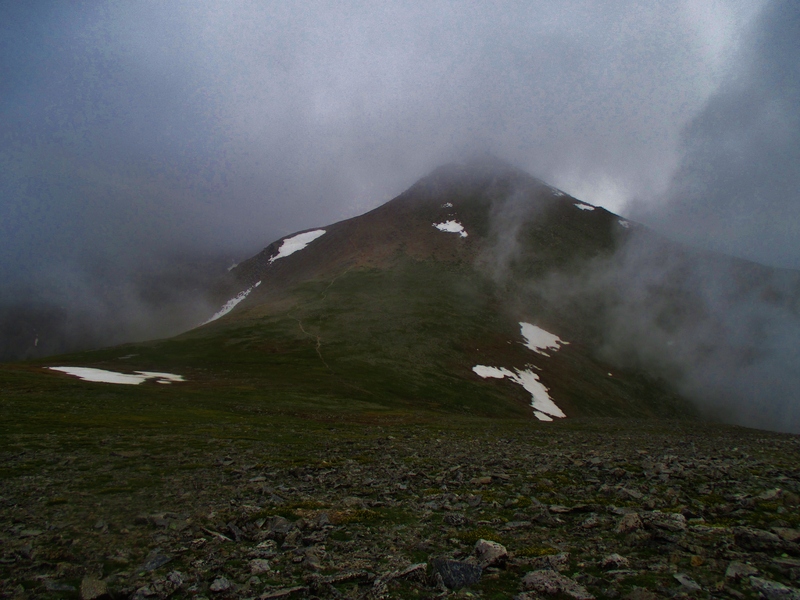 The storm brought with it several flashes of lightning, so at this point I abandoned any hope of bagging Kit Carson and began making my way down the mountain. You might say I made a beeline…for the treeline. It was a slippery, slushy descent. I was pretty soggy by the time I made it back to the trailhead around 2:30 pm. Decided to drive up to Salida, CO where I grabbed some pizza & brew and crashed for the night in a Walmart parking lot. The forecast for 7/6/15 called for afternoon storms, so I decided to get a (very) early start. Slept in a Walmart parking lot in Montrose, CO, and woke up at 2:15 am with plans to start hiking at 3:45 am. 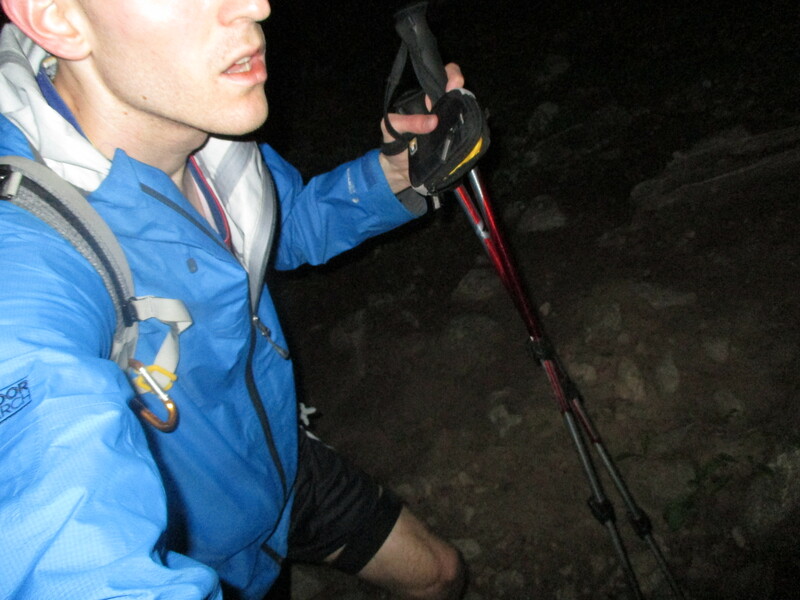 I underestimated how rugged the road to the trailhead was, however, and didn’t end up starting until more like 4:15 am. In the process, I managed to navigate my little Honda Fit across several small streams and some very rocky stretches of road. I still ended up having to park about half a mile below the Lower TH. 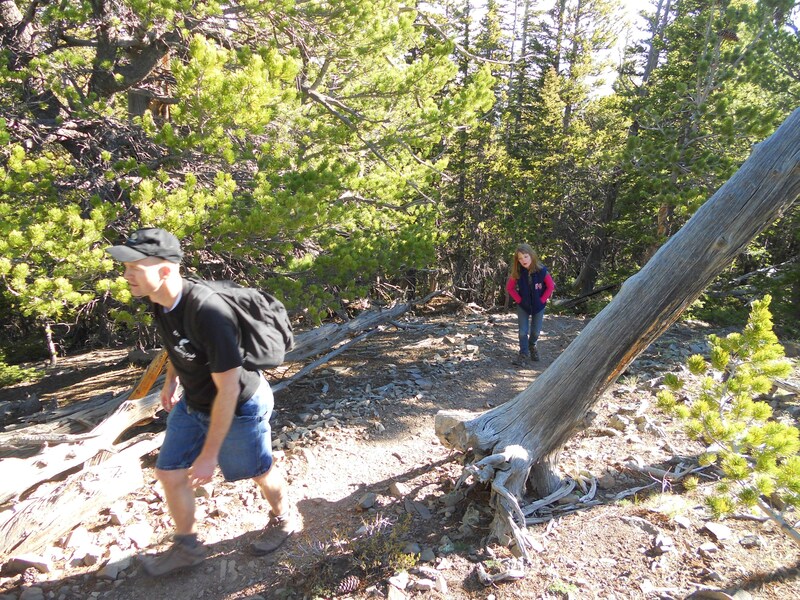 The hike to the base of Mt. 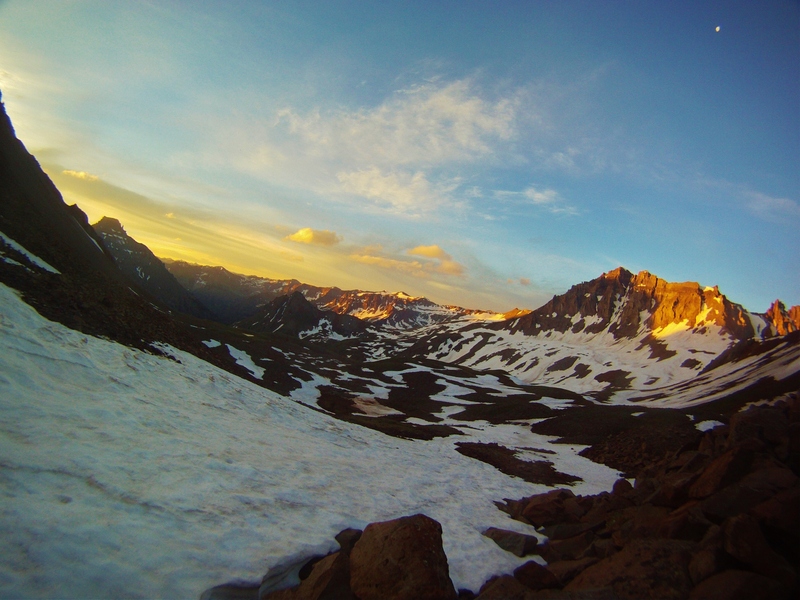 Sneffels (14,150′) went pretty quickly, and I found myself climbing the mountain’s lower slopes just as the sun started creeping over the horizon. 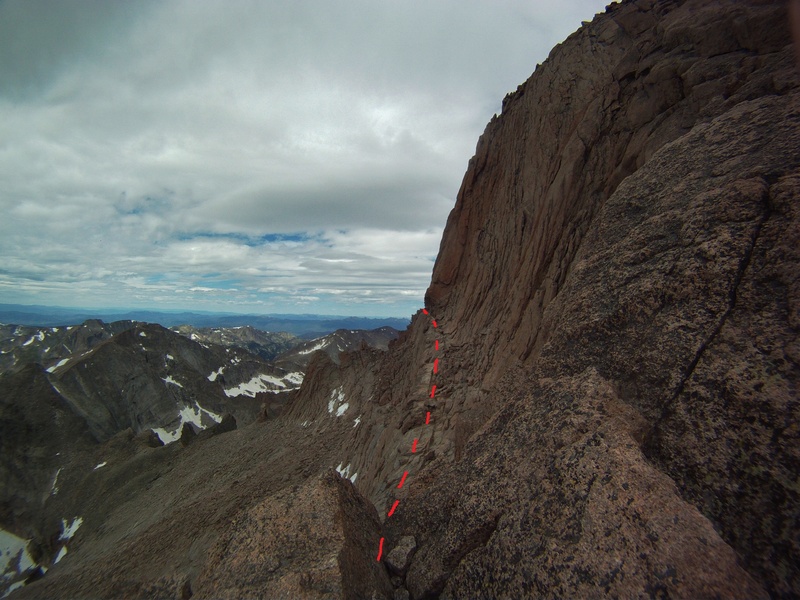 I had opted for the standard route (rather than the enticing SW ridge) since I was tackling this solo, and since I’d seen online reports of some fun-looking snowpack in the Lavender Couloir. 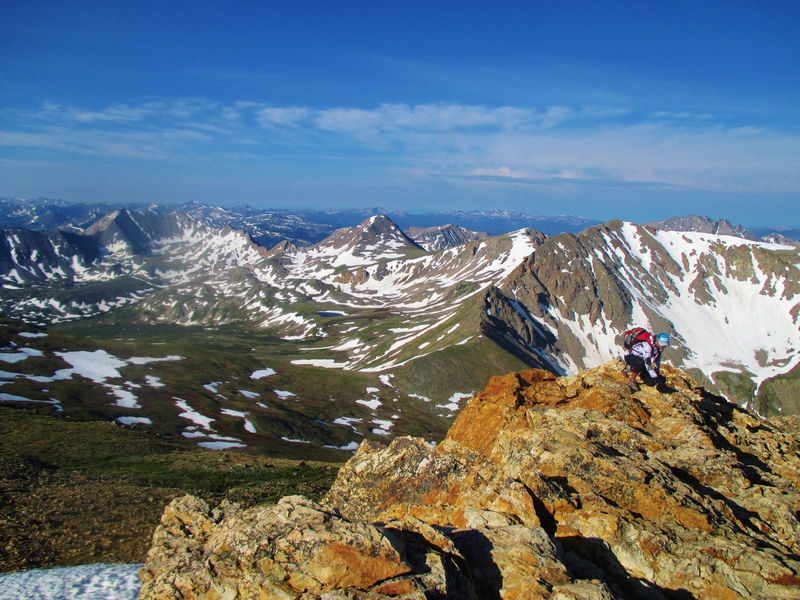 The initial scree climb to the Sneffels-Kismet saddle was kind of obnoxious…but rewarded me with some great views from the top. The climb was a lot more interesting from here on out. 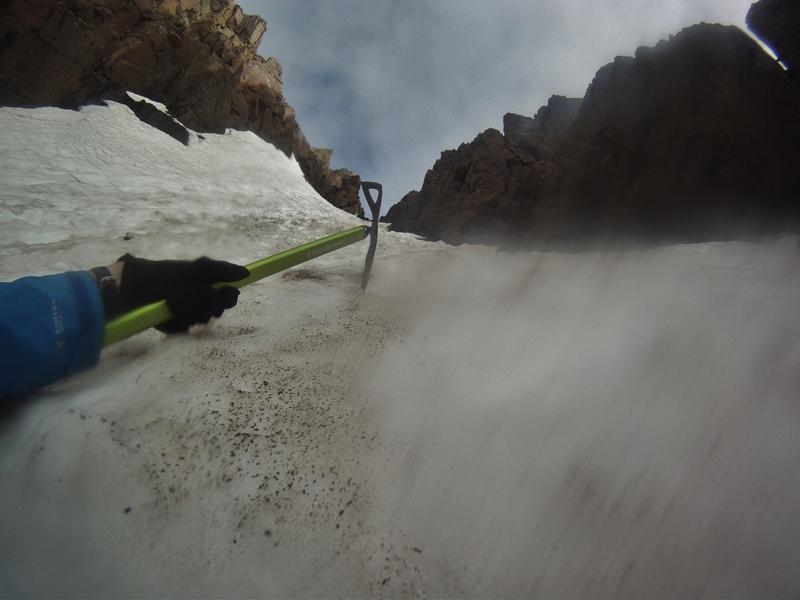 In order to reach the “V Notch” – a short scramble to gain access to the summit – I had to climb about 300-400 feet of steep snowpack. 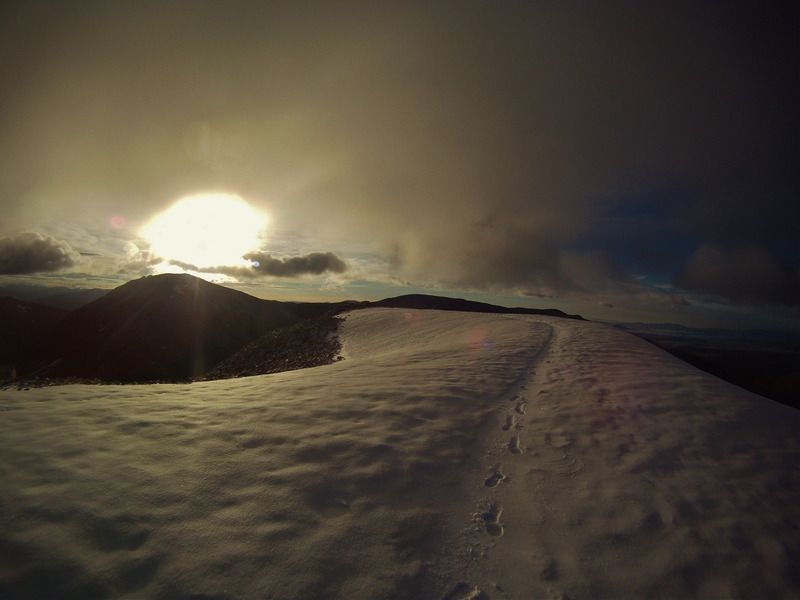 It wouldn’t have been feasible without my ice axe, and I found myself wishing for crampons (and/or a rope) more than once. 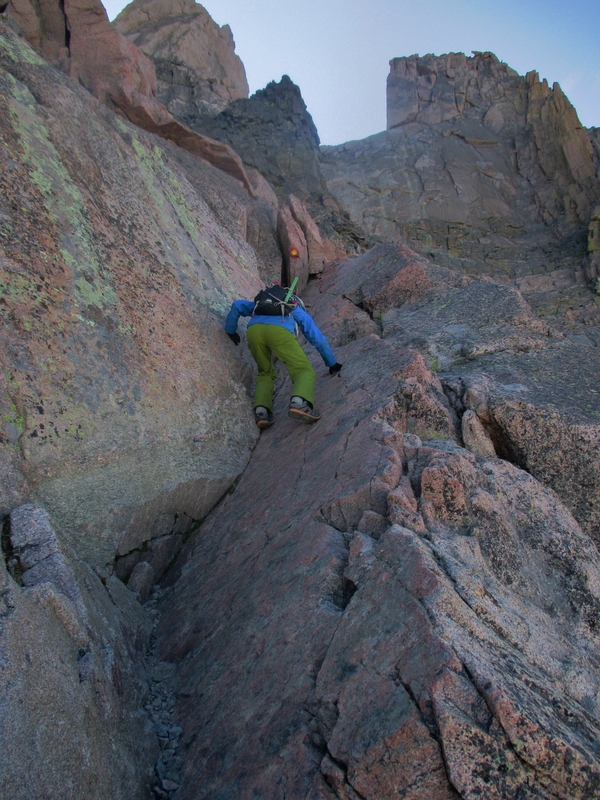 I would occasionally stop and re-descend a few dozen feet before continuing upward. 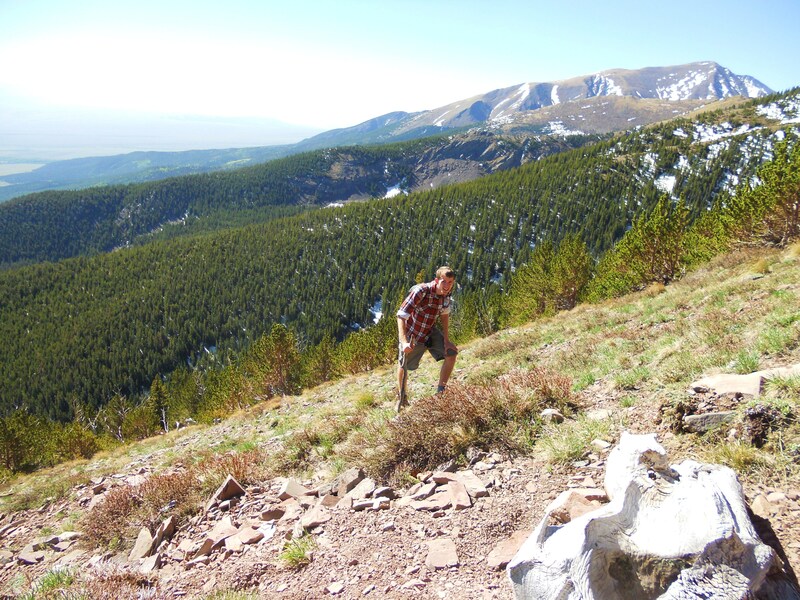 My #1 rule is to “never climb up what you can’t climb down”…so I found it useful to test myself periodically. 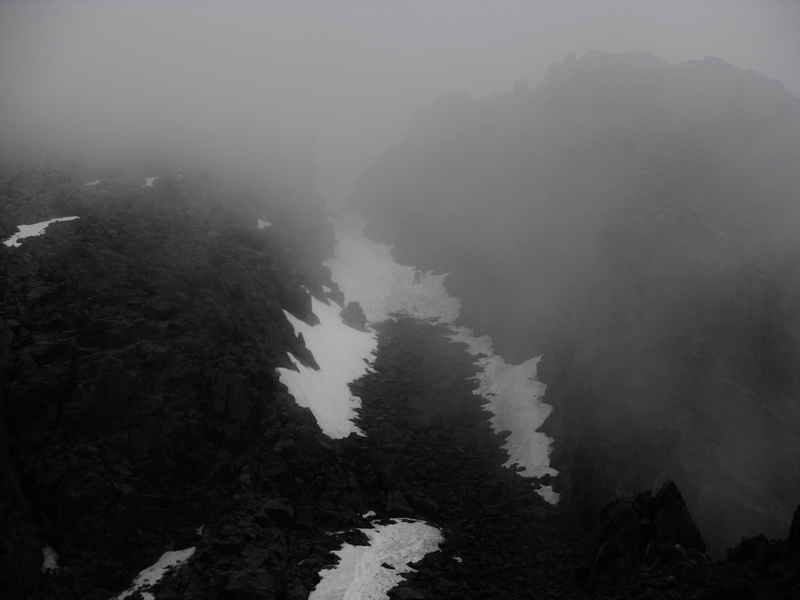 I finally made it to the “V Notch,” made the final scramble to the summit (which was now enveloped in a cloud; no good views unfortunately), and began retracing my steps. I had to self-arrest once on the descent. A chunk of snow and ice came lose under my feet, and I ended up tumbling 100 feet or so before my axe finally brought me to a stop. The rest of the descent was uneventful. On my way down the scree slope, I was able to capture a shot of two other climbers in Lavender Couloir, just as the storm clouds started moving in. I finished the day right around lunchtime. A couple of other climbers even offered me a ride in the bed of their pickup to save me a 45 minute walk down the 4WD road, which was nice. 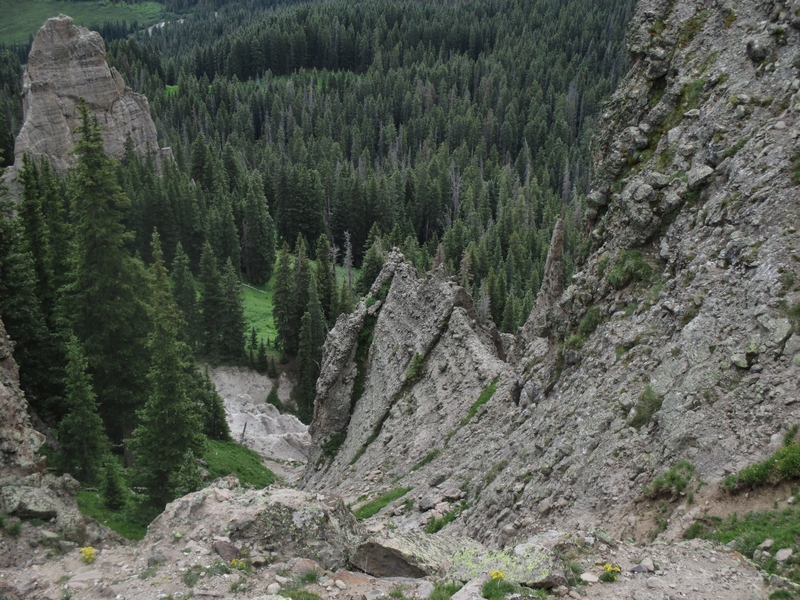 As mentioned previously, I had been planning to climb Castle and Conundrum Peaks on 7/5/15…but between the weather forecast and my sore left knee (courtesy of the Kettle Moraine 100k four weeks ago), I instead drove down to the San Juan range for something a little shorter and easier. I didn’t actually settle on Courthouse Mountain (12,152′) until the morning of 7/5. And I wasn’t entirely sure where the mountain was, precisely. 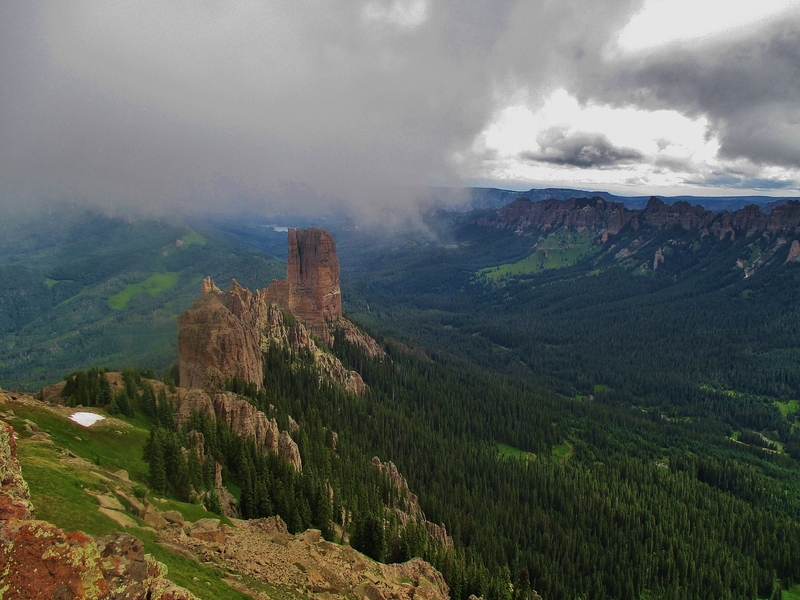 Just that it was somewhere in the Uncompahgre National Forest, accessible by a tangled network of dirt roads. Which, thanks to some poor planning, I began exploring with a gas tank perilously close to empty. But I did have some vague/sketchy instructions I’d found online (“keep right when you go around the big lake…turn left at one of the crossroads before you get to Owl Creek Pass”). So that was something. And after some trial and error, I found it. The hike to the base of Courthouse Mountain was pretty short, and gave my knee a much-needed chance to recover before the more intense climbs I had planned for later in the week. The mountain itself was really scenic, with sprawling views of Chimney Rock and some of the larger, better known peaks in the area. 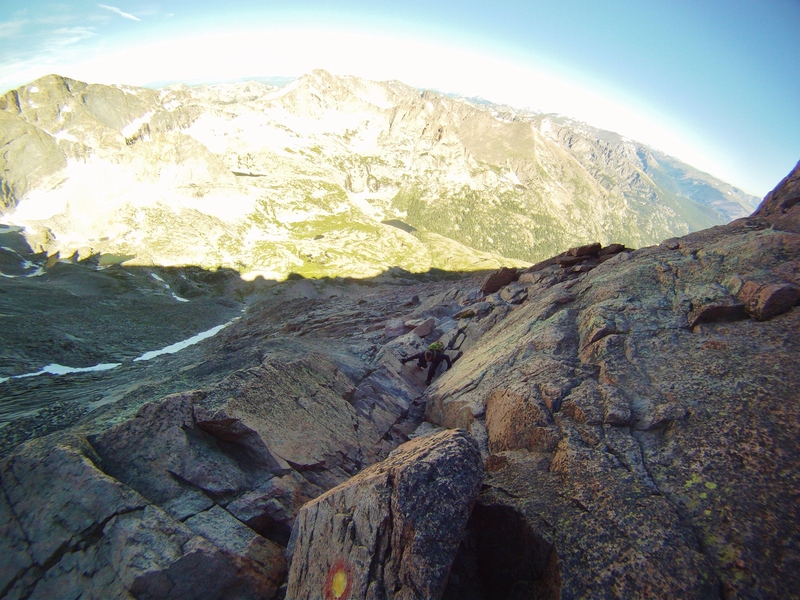 Above the treeline, the route was a straightforward class 2+ hike/scramble. I accidentally got off-trail at one point, though, and ended up scrambling on some fun class 3. At the top I met a guy who works for the Forest Service and got a couple pictures. 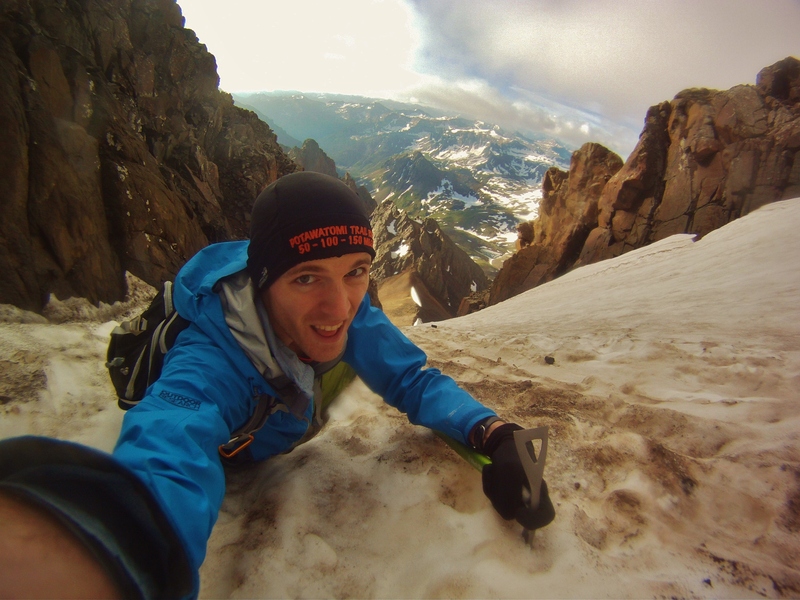 It turned out to be a fun day, and a nice warm-up for Sneffels. 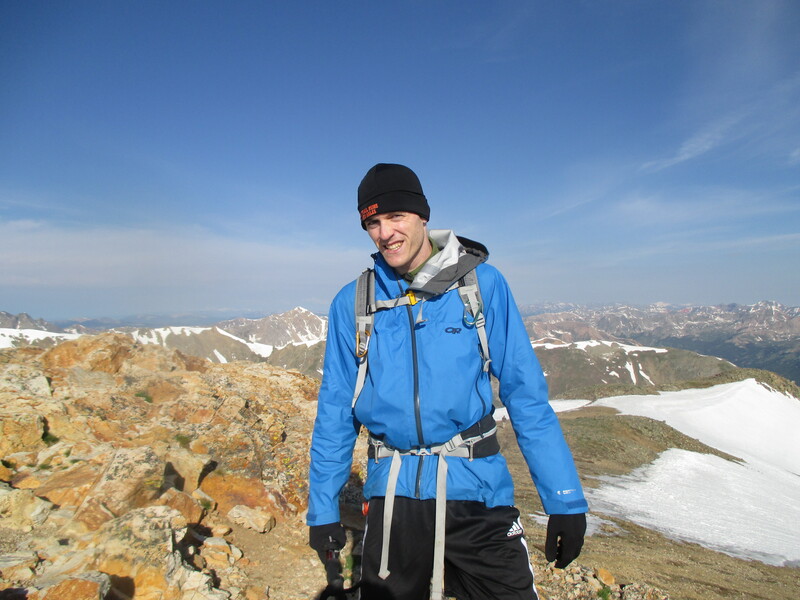 Having just finished Step 2CK, I had an entire week to go climb mountains in Colorado while Allison and Micah flew out to Pittsburgh to visit family. I’d been planning this trip for awhile, and was planning to climb roughly 15 mountains over the course of 6 days. I drove out on July 3 (Milwaukee to Chicago to drop Allison & Micah at the airport, then to the suburbs of Denver for a quick night’s sleep in a Walmart parking lot). 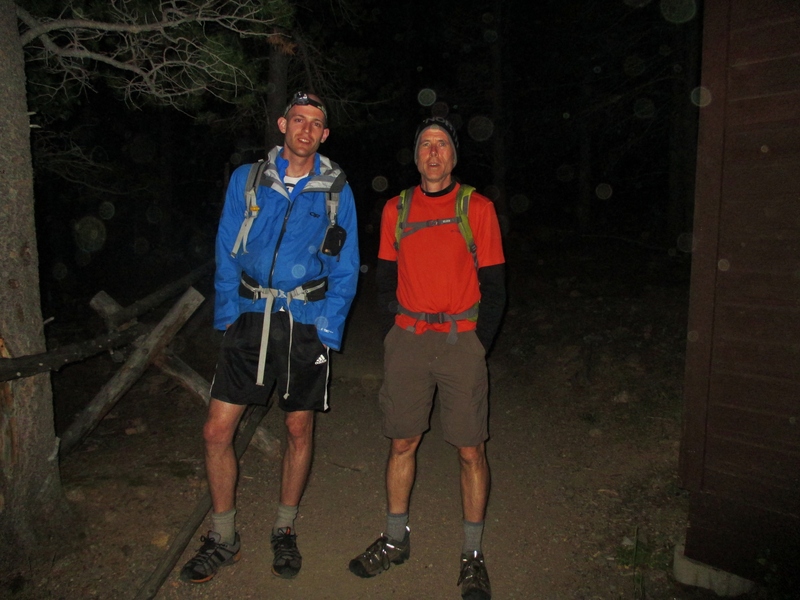 I woke up at 2:30 am to make the final tw0 hour drive to the trailhead, and hit the trail at 4:45 am. I only ended up needing the headlamp for 15-20 minutes, and the early start was really helpful in staying ahead of the 4th of July crowds. This would become a theme for the week. 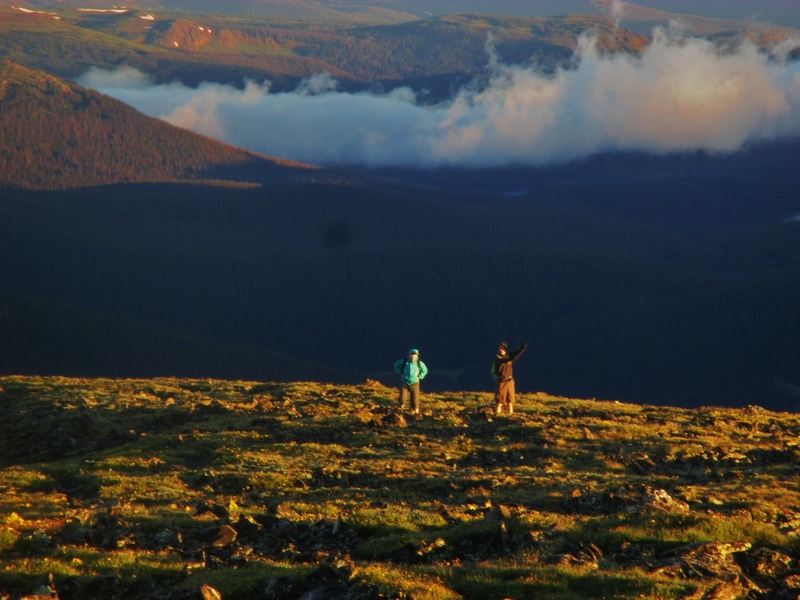 Wake up at 2-3 am, start hiking around 4 am, and try to be back below treeline before the daily afternoon storms rolled in. It turned out to be a very stormy week. 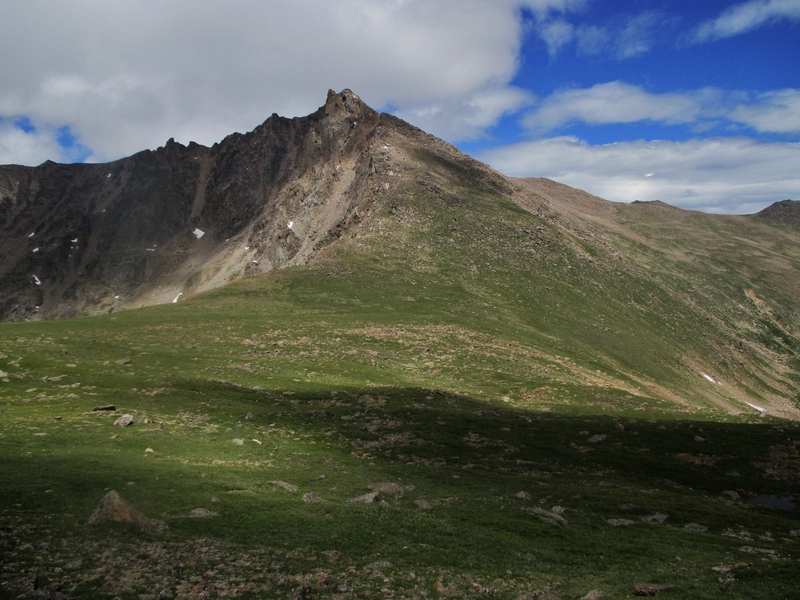 The trail was pretty steep, and I made the long slog up to Peck’s Peak (13,270′) a little after sunrise. From there is was a short uphill hike to Mt. 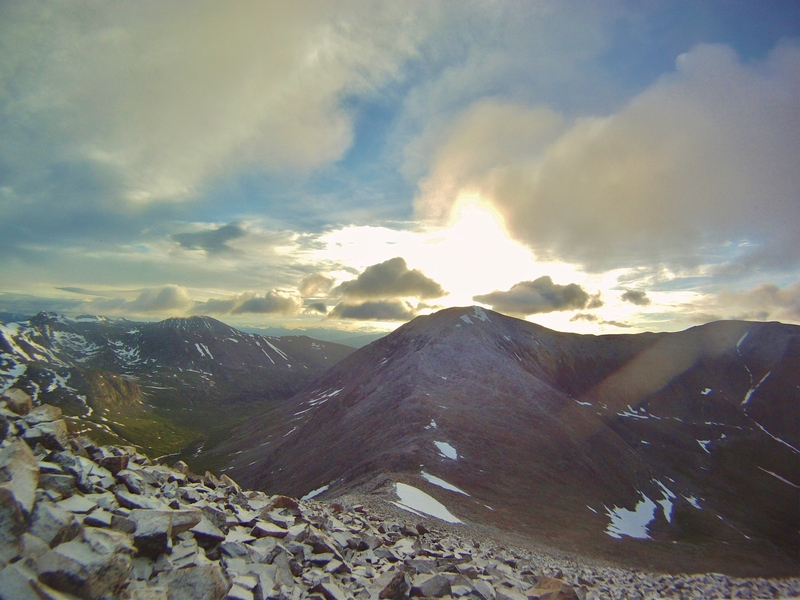 Belford (14,197′), my first of what would eventually be ten 14,000′ peaks in the span of six days. 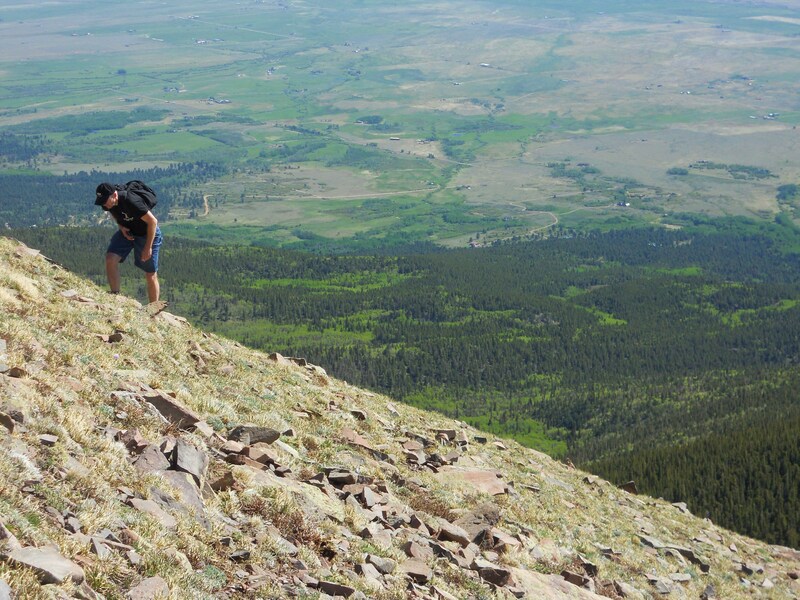 I was still sort of adjusting to the elevation, and have to admit that I was somewhat short of breath by this point. I made the traverse over to Mt. Oxford (14,153′) at a more leisurely pace. At this point I briefly considered going for Missouri Mountain, Iowa Peak, and Emerald Peak…but decided instead to head back over Mt. 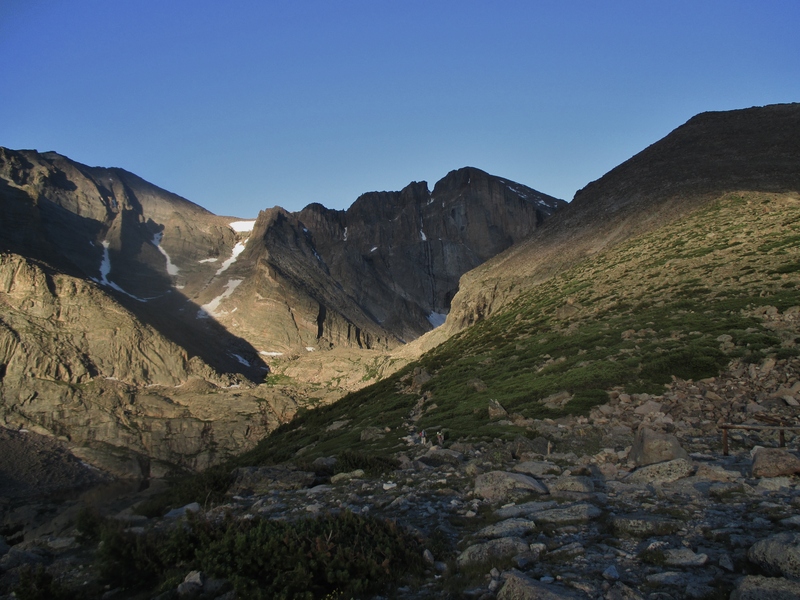 Belford and descend back down the Missouri Gulch. There were some dark clouds starting to move in, and I didn’t want to completely shred my legs on the first day of the trip. Made it back to my car mid-afternoon, checked the weather forecast, and decided to scrap my plans for Castle & Conundrum peaks the next day. Instead I drove down to the San Juans for an extra day of climbing. 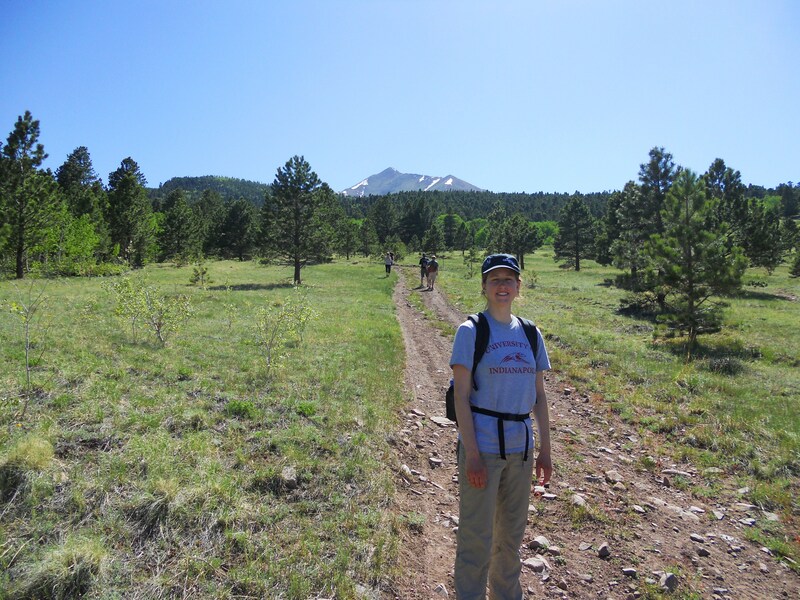 After leaving the Grand Canyon, Allison and I spent several days with my family at the Horn Creek family camp in Colorado. 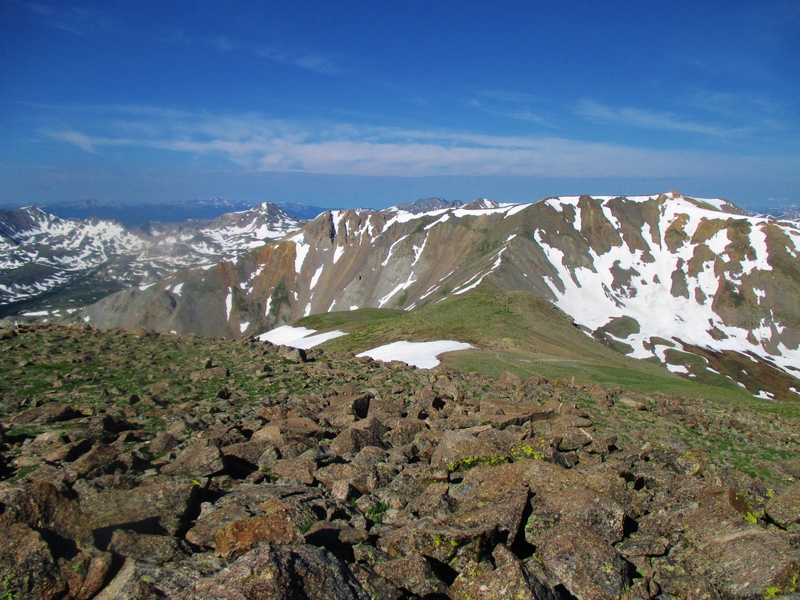 On June 7, we all set out to climb Horn Peak (elevation 13,450’). We began the hike around 6:15am, reached the summit at 11:15am, and returned to camp at 4:20pm. The first few miles were steep, but not terribly difficult. 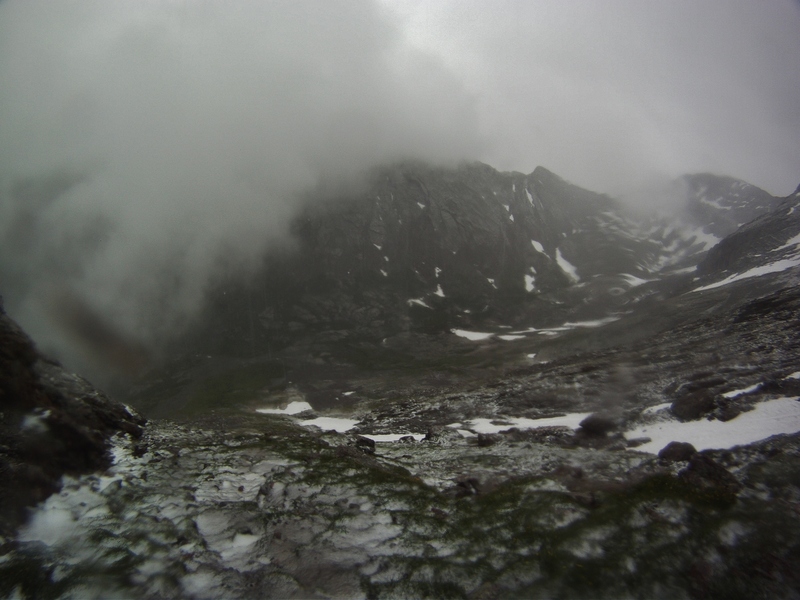 We had to leave the trail a few times to avoid snow drifts, but the three guides accompanying us knew the route pretty well. 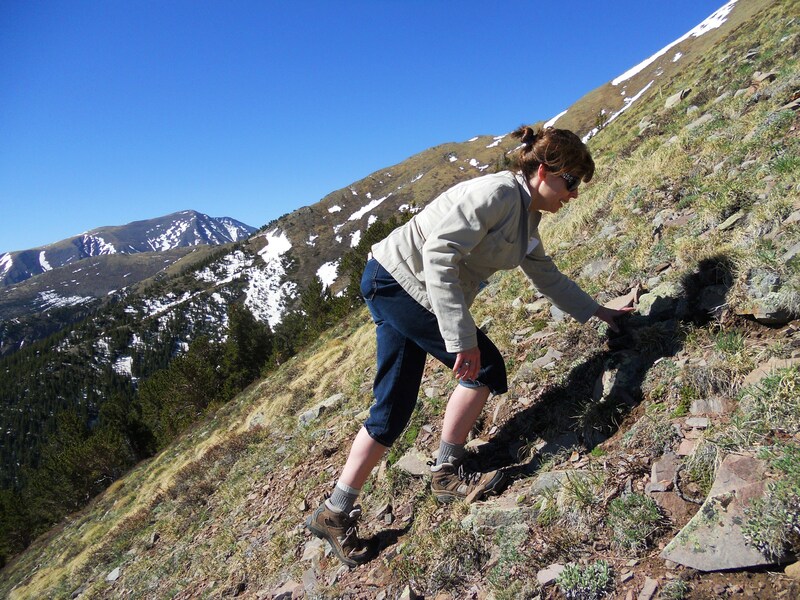 The real challenge came when we reached the tree-line and started a steep, exposed climb up to the false summit. Aside from the thin air and dizzying heights, we got to deal with powerful wind gusting at 45-50mph. There were a few tears, but Mom, Dad, Trent, Meredith, Caroline, Allison and I all made it to the false summit in one piece. Two of the guides were still with us, but the third stayed back with another man and his daughter who couldn’t handle the challenge. 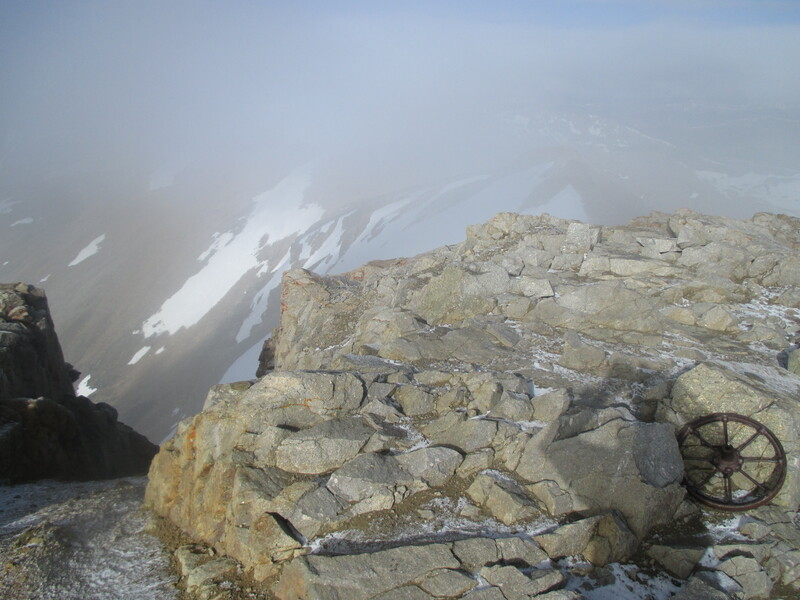 The ridge between the false summit and the true summit was less steep, but much more rocky. Fortunately, the wind had died down enough by now for us to hear each other talk. After making it to the peak, we ate some snacks and took pictures for this year’s Christmas cards. 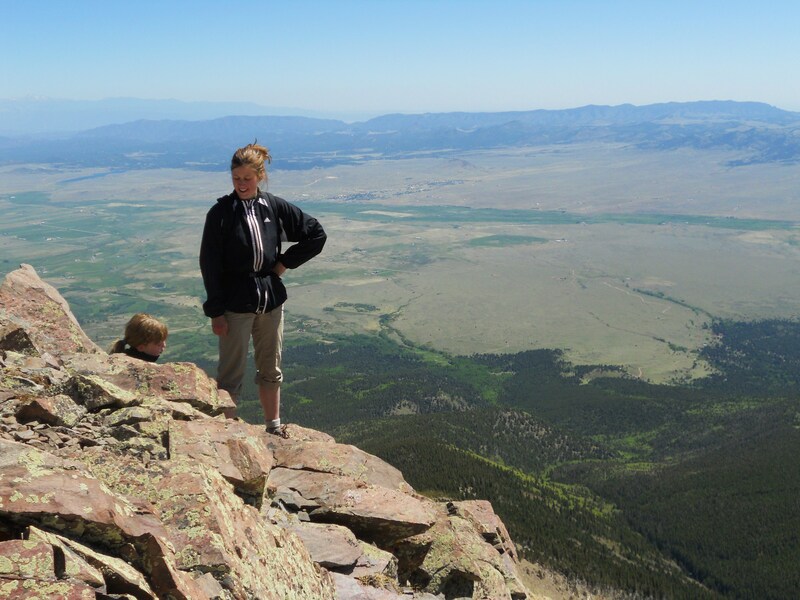 Both my sisters thought the whole idea of climbing a mountain was stupid in the first place, so I think they were only too glad to start the descent. 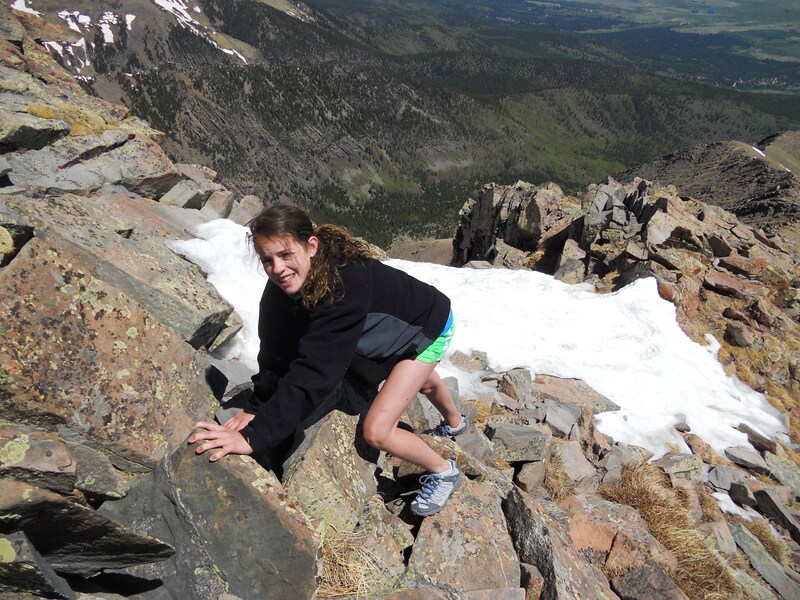 I should also mention that Caroline made the climb with a broken elbow, and Trent had three fractured vertebrae (leading to several “Brokeback Mountain” jokes).